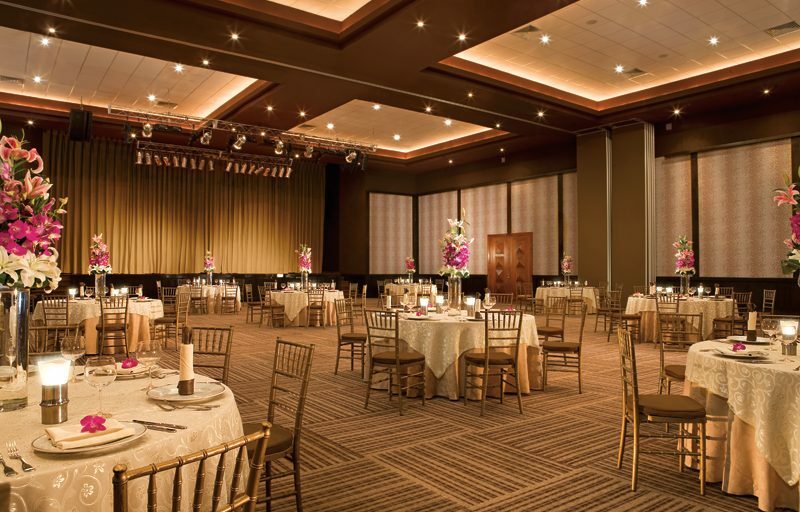 Find out more about this venue! 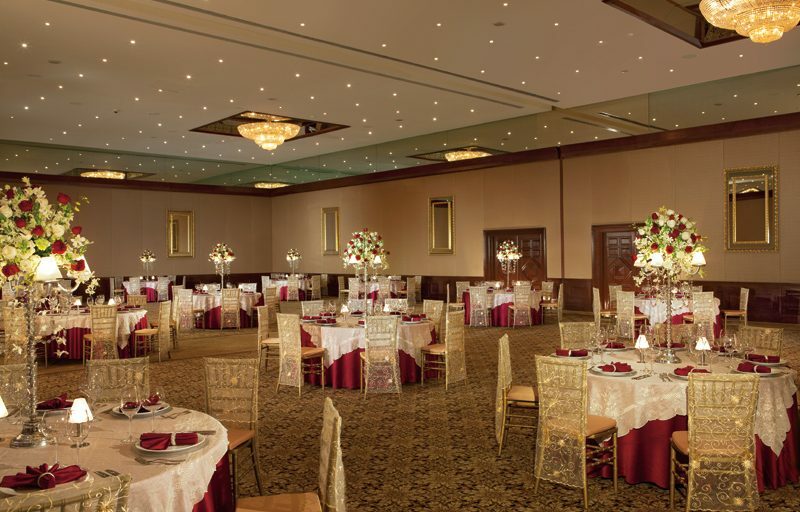 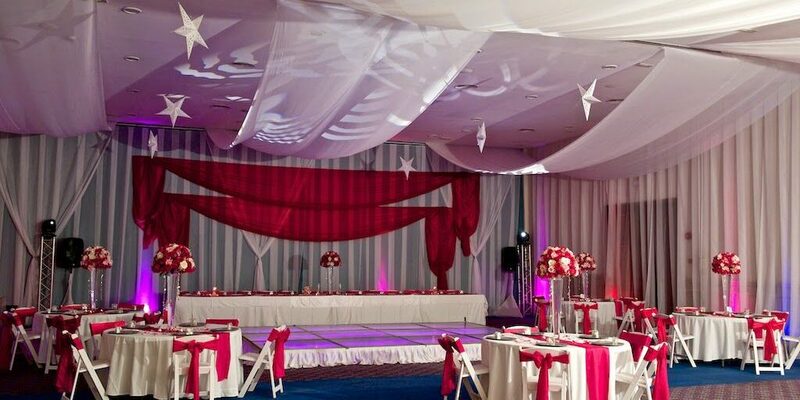 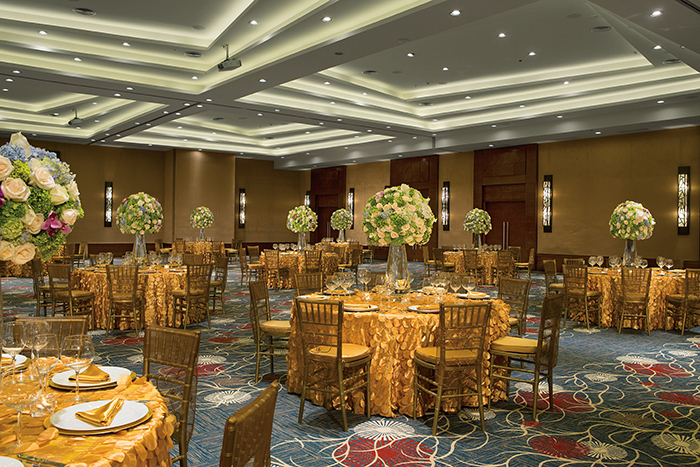 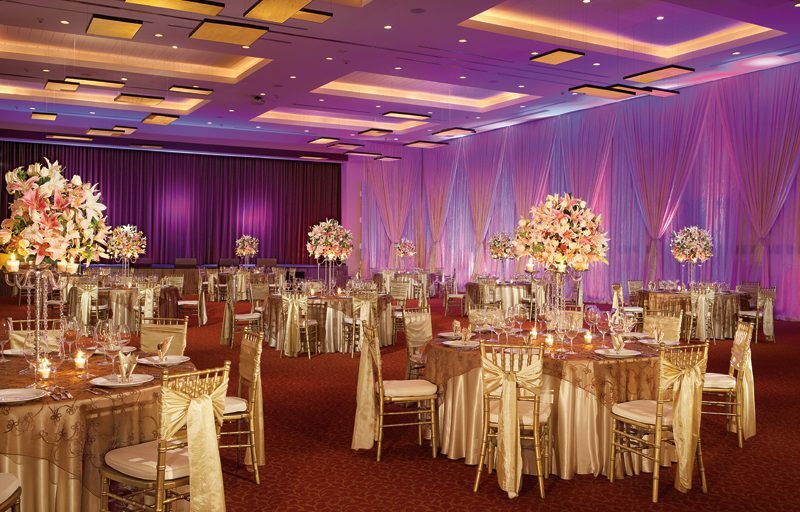 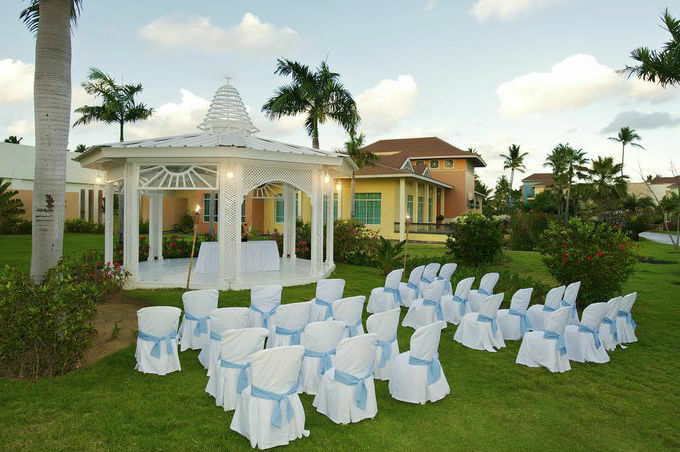 The resorts we work with provide a variety of beautiful destination wedding venues that cater to any vision and every budget. 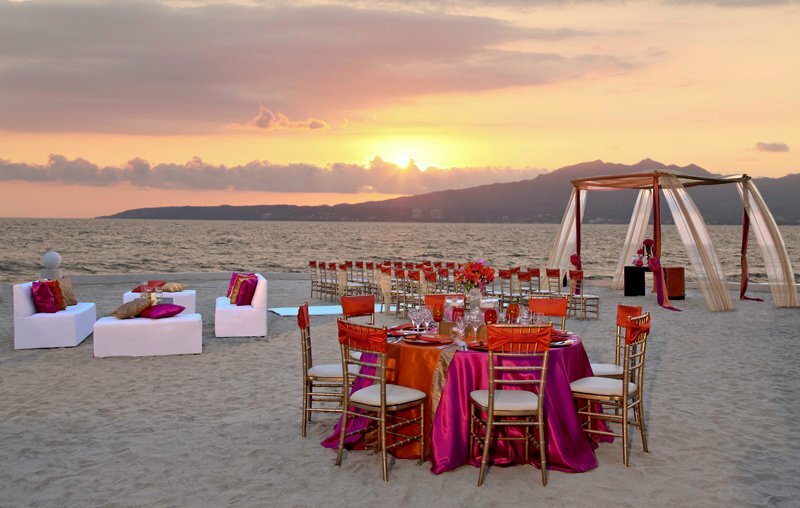 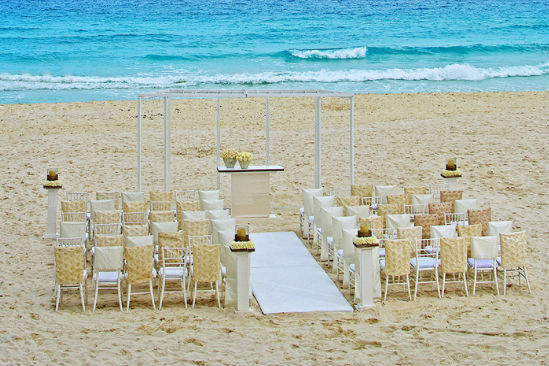 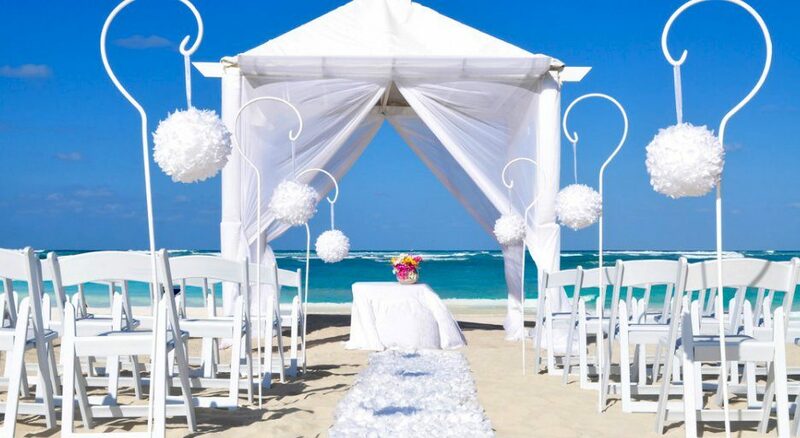 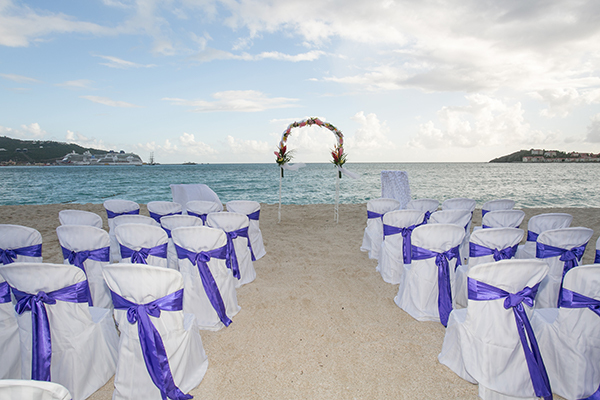 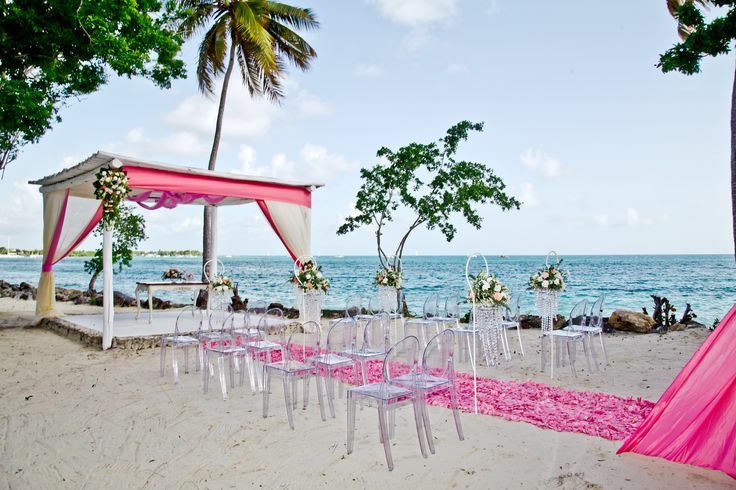 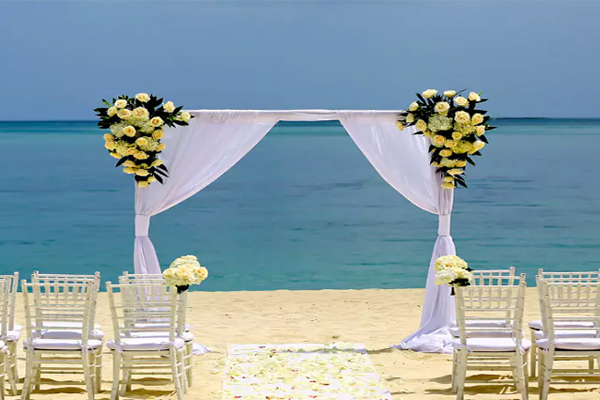 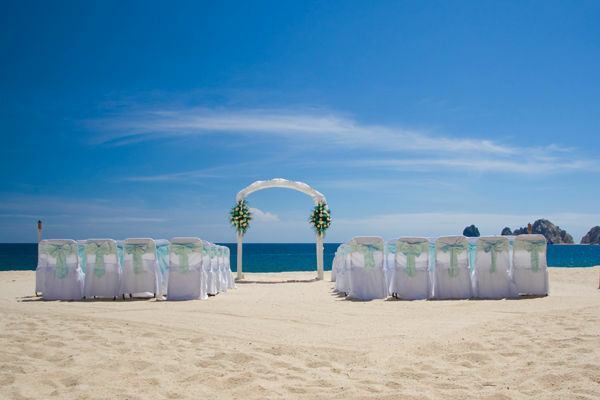 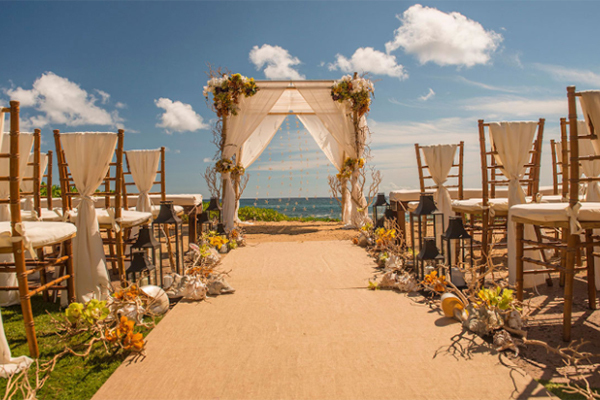 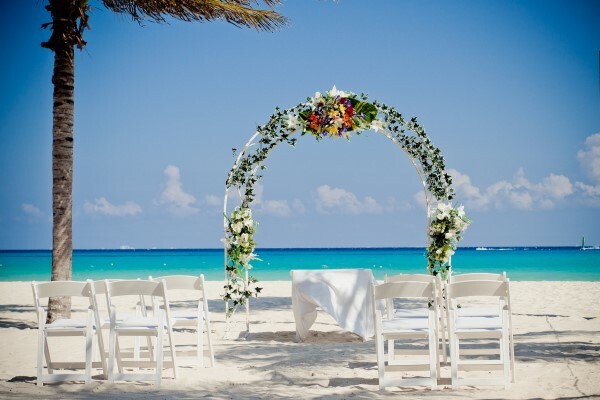 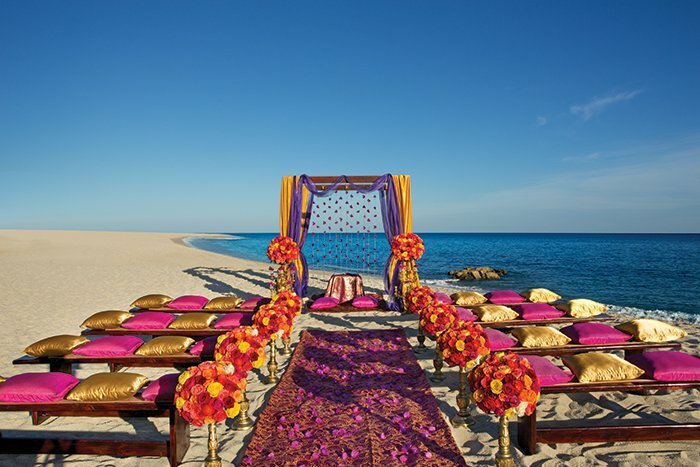 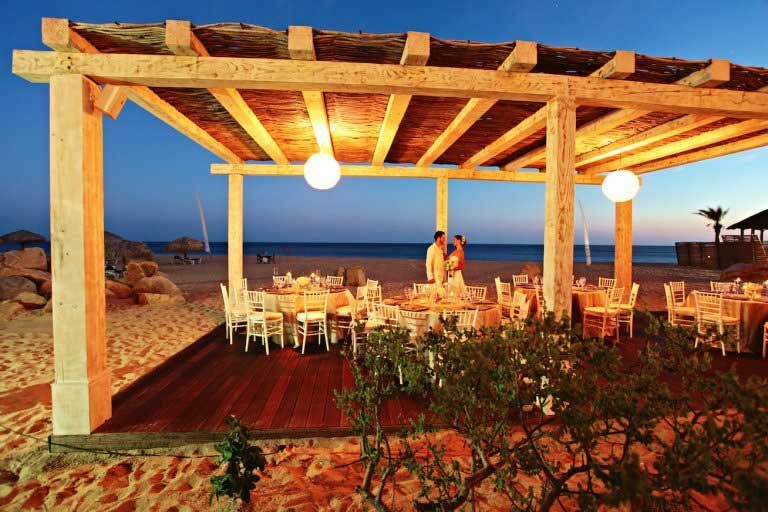 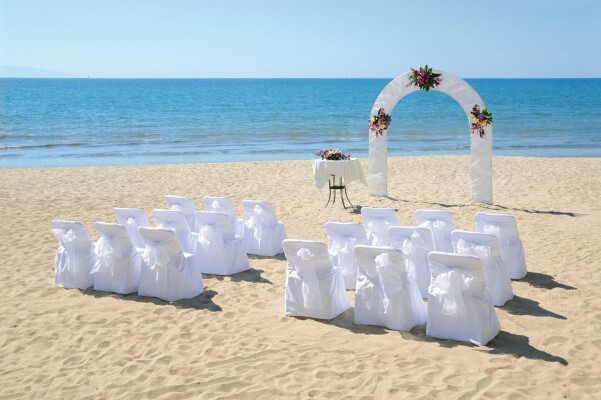 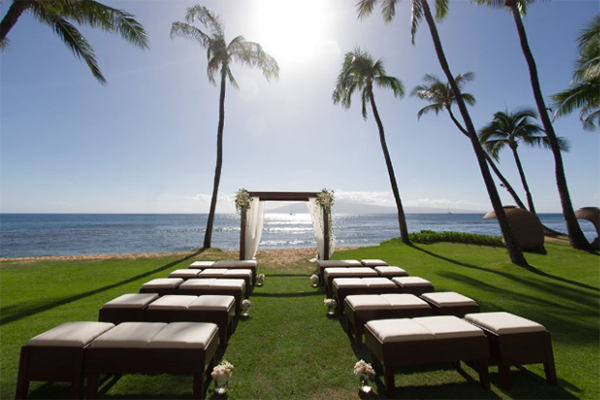 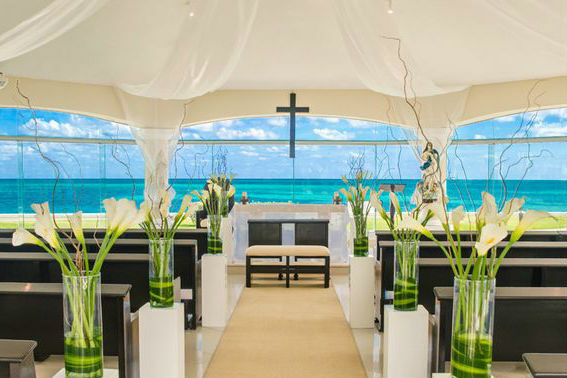 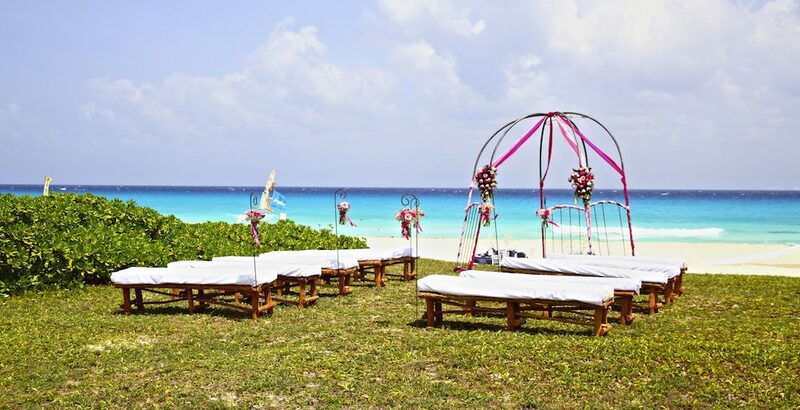 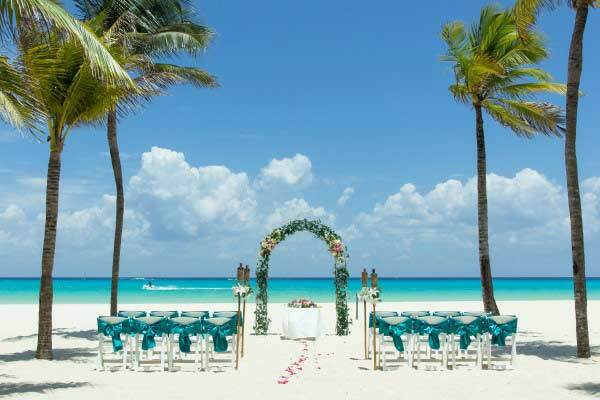 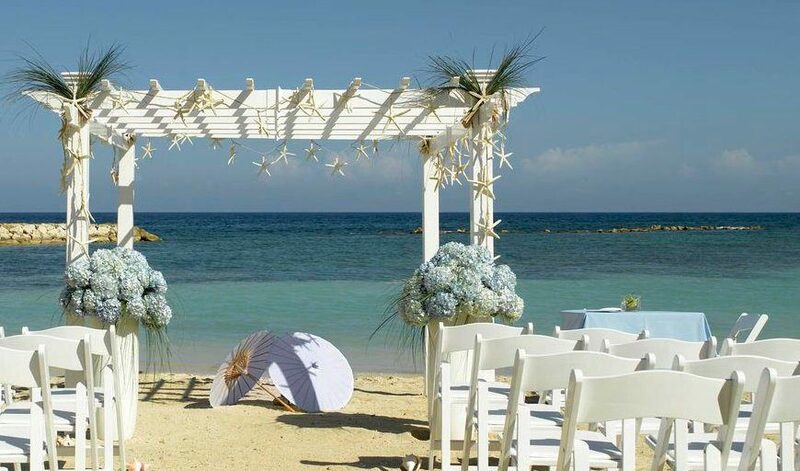 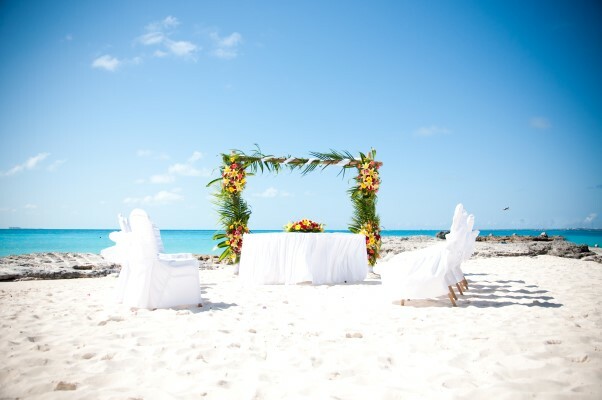 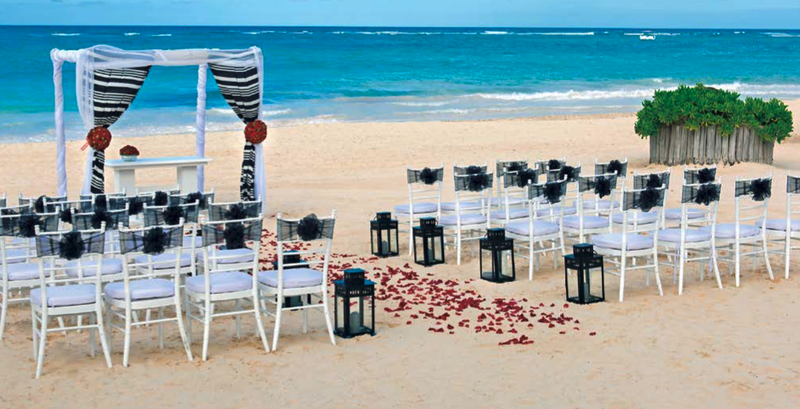 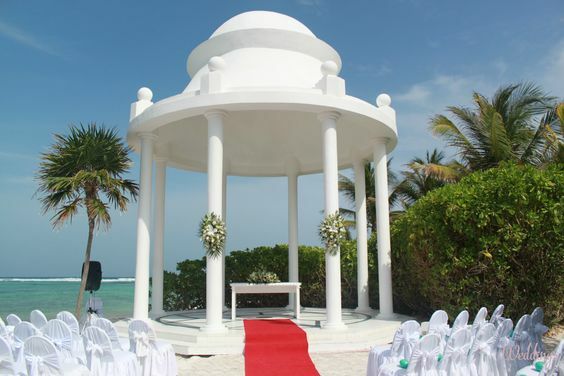 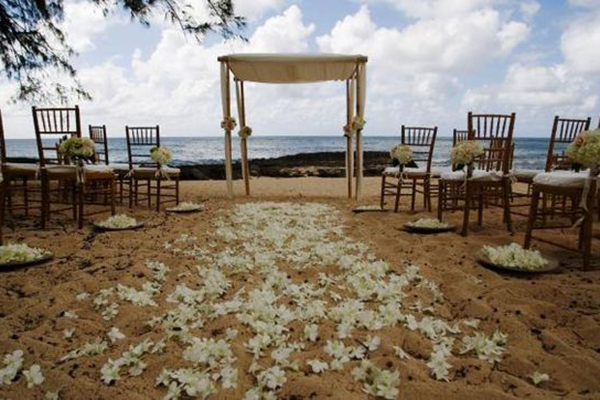 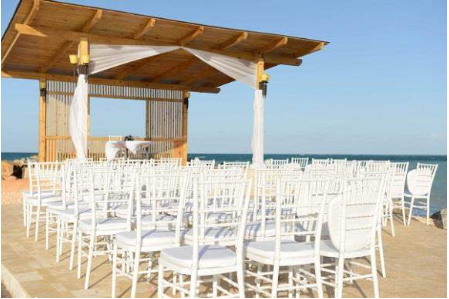 Beach ceremonies can accommodate most any size guest list and are the most popular choice for destination weddings. 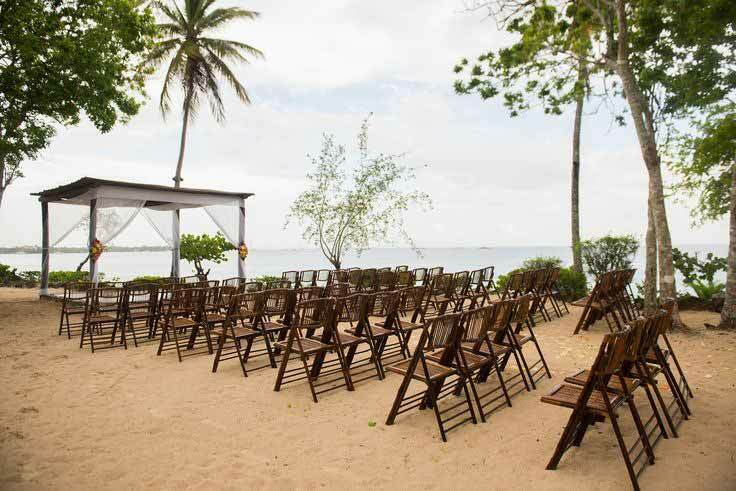 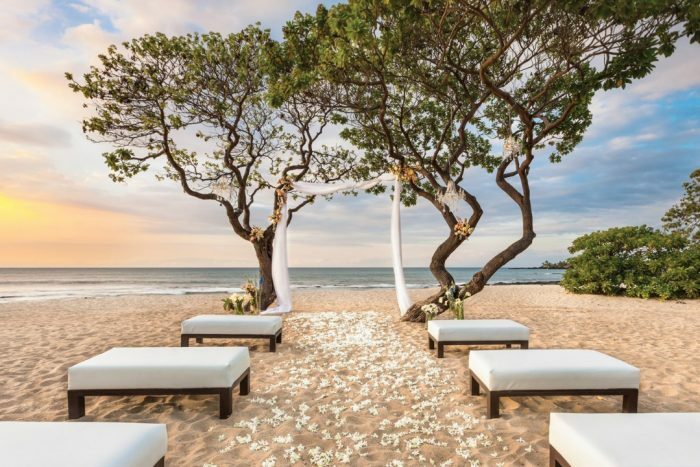 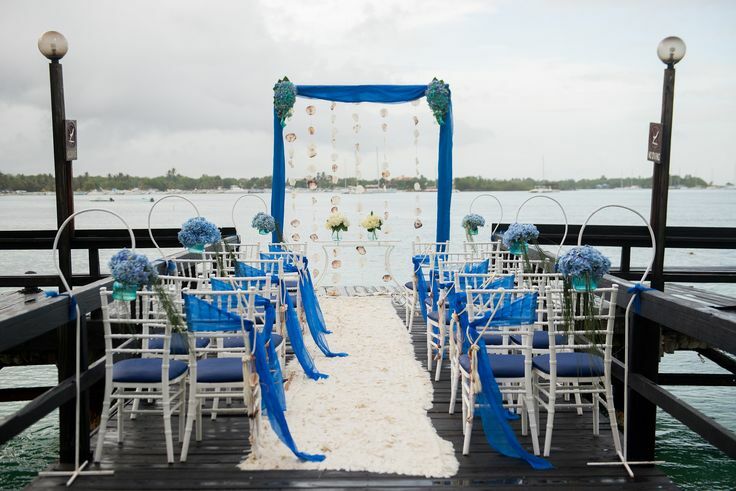 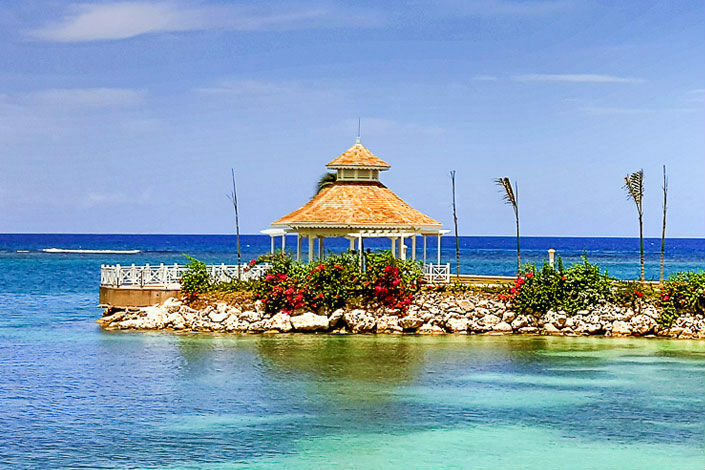 With views of the ocean as your background, beach venues provide an unforgettable location amongst the many beautiful waters our resorts rest on.However, beach ceremonies are not all we offer. 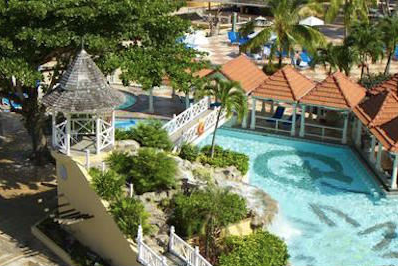 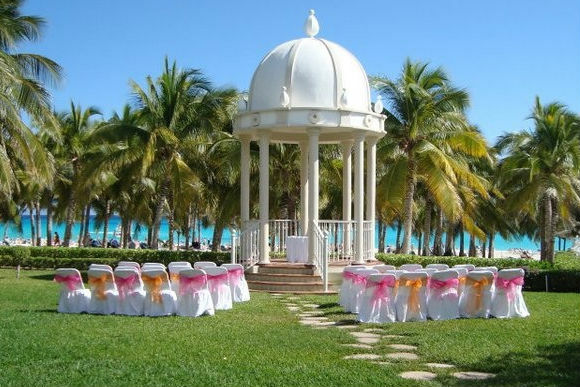 Take for instance the lush garden venues or the scenic gazebos, that range from small to big, and feature amazing views. 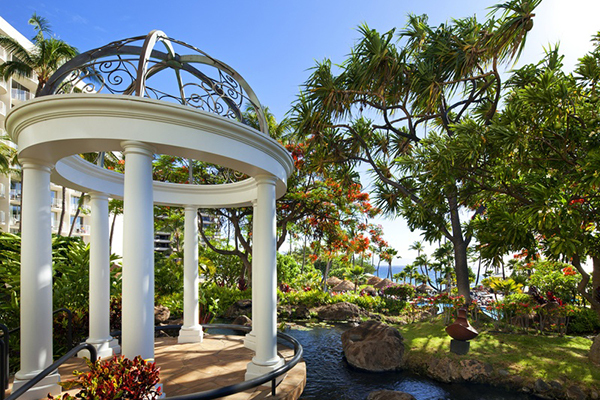 Several of our gazebos stand on the water, connected by bridges. 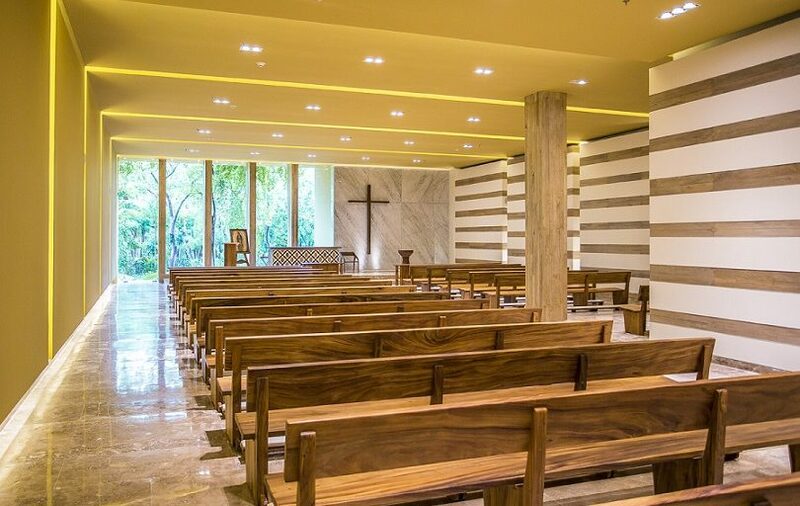 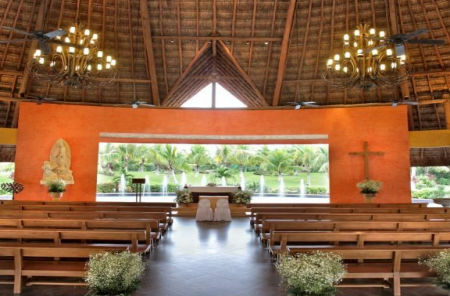 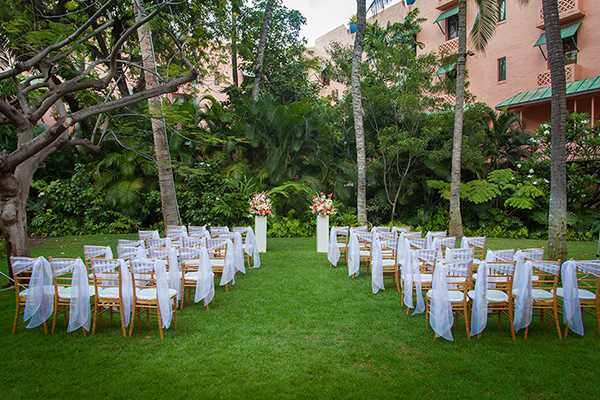 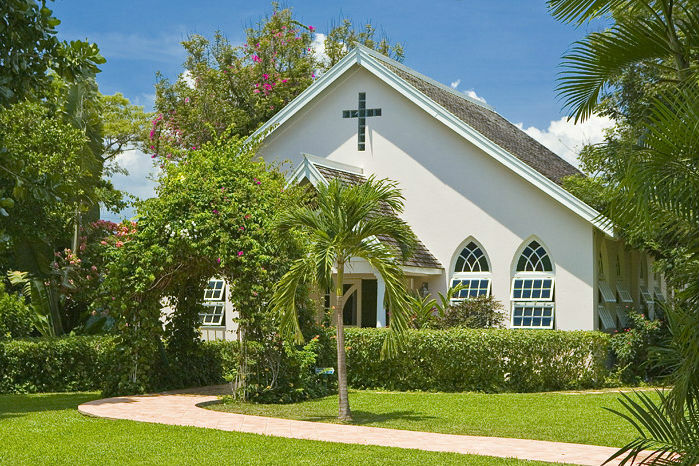 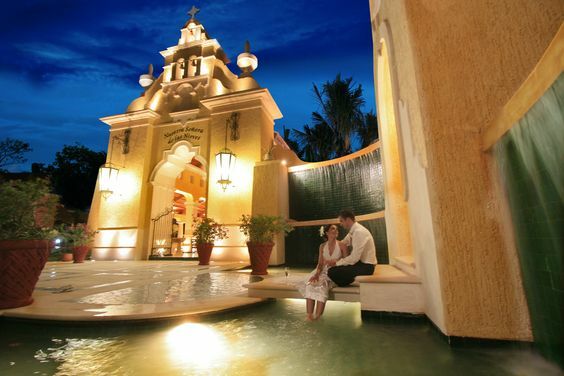 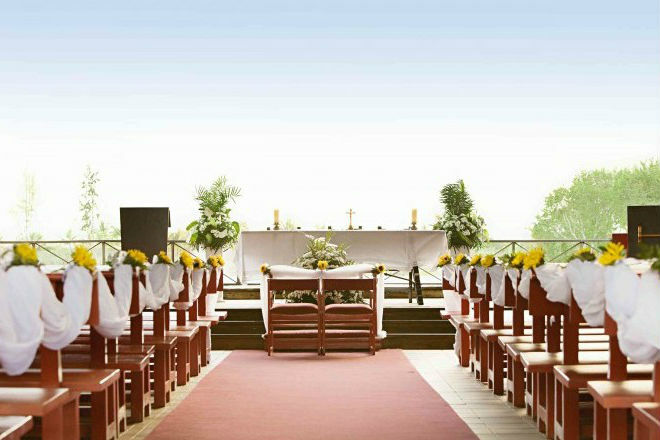 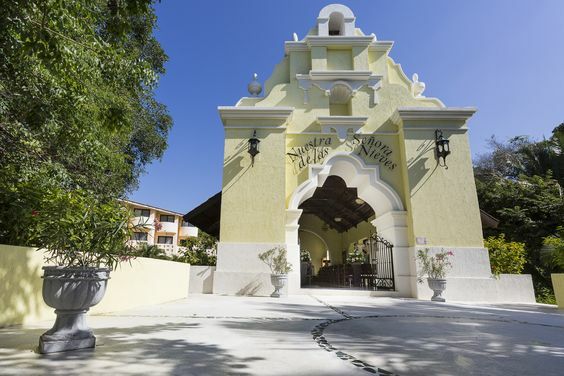 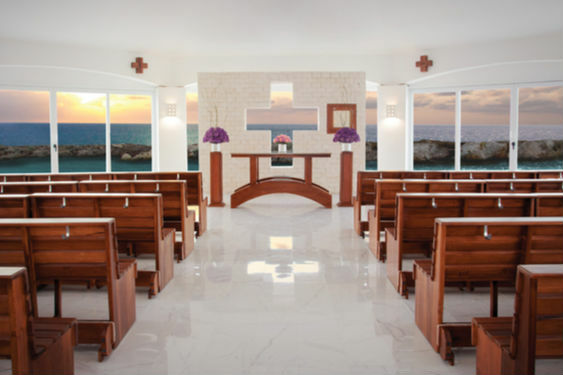 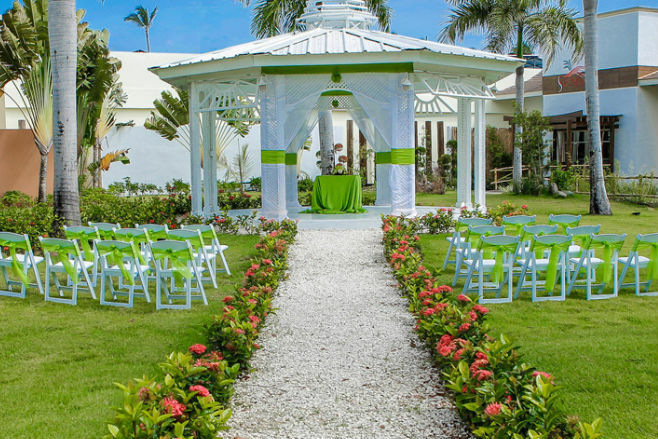 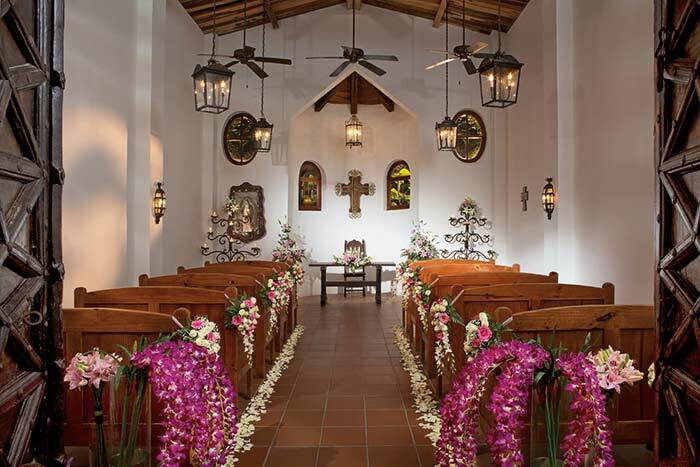 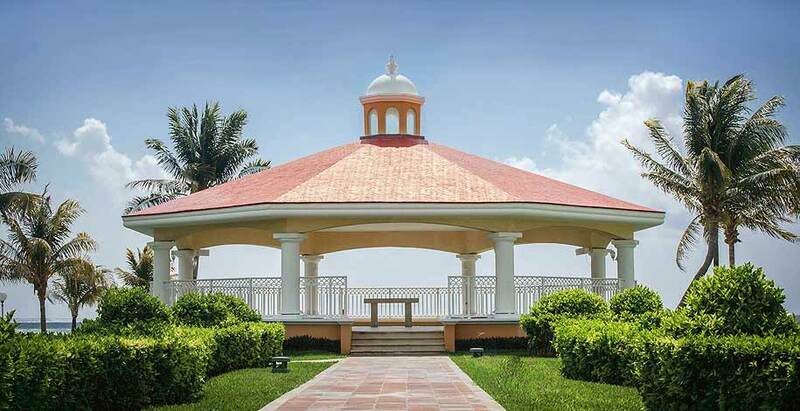 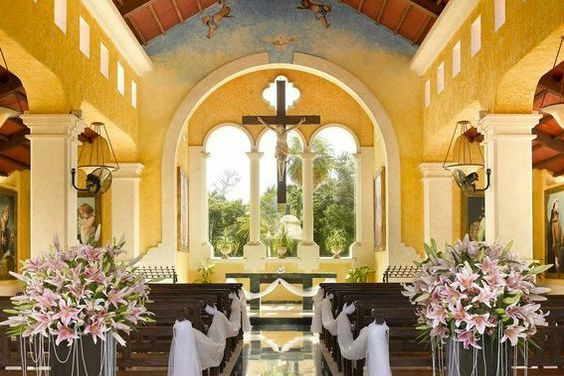 Our garden venues range from lush open plazas to tranquil settings off the beaten path surrounded by fauna.For couples who require a Catholic ceremony, our resorts offer numerous chapels, that vary by design. 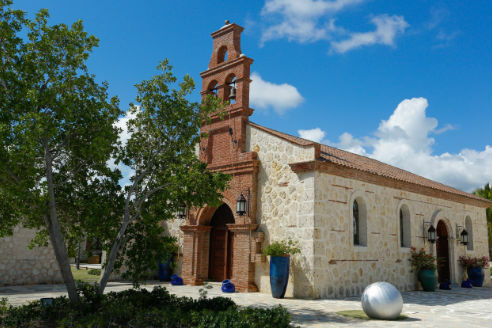 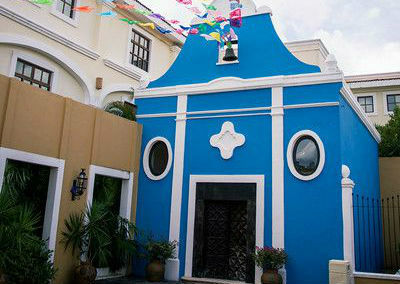 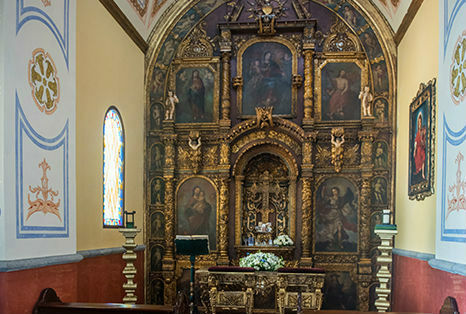 You’ll find modern sanctuaries influenced by contemporary design, or quaint Spanish churches utilizing old world architecture. 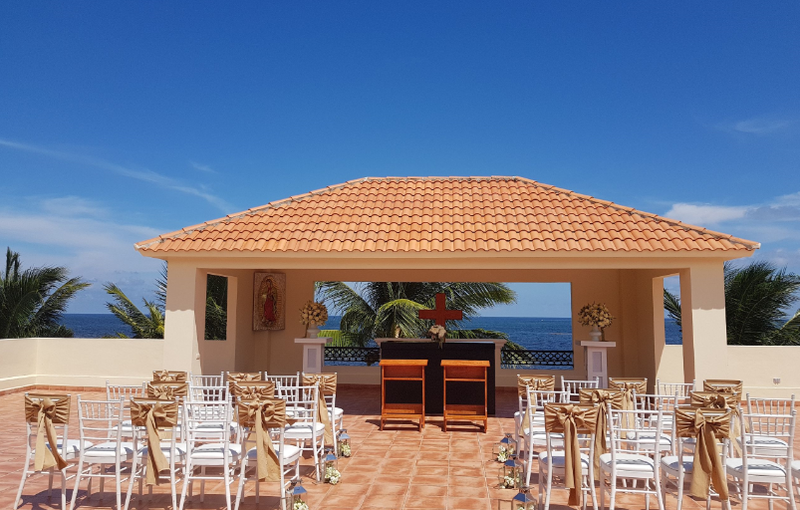 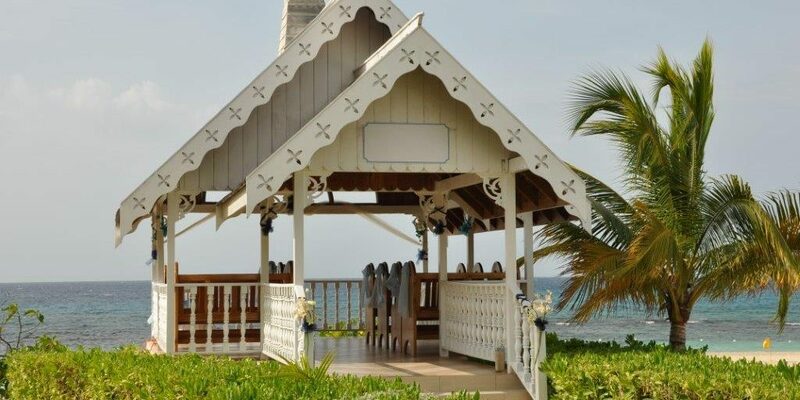 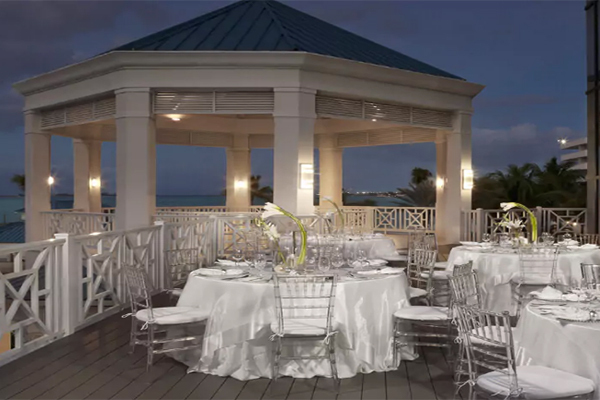 Some of our chapels are partially open to the elements, allowing the exotic location to feature ocean views.For those seeking out wedding venues from a higher vantage point, we have multiple rooftop venues that provide unbelievable views paired with privacy. 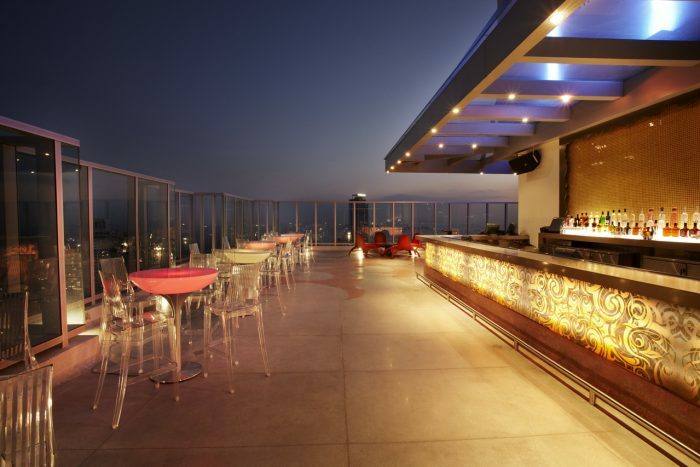 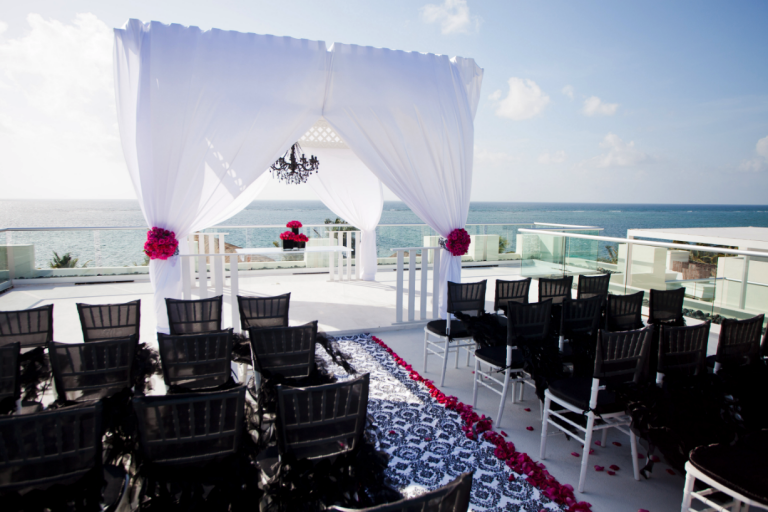 Most rooftop venues tend to be private rental spaces, and it’s also fair to say that most offer stunning sunset views. 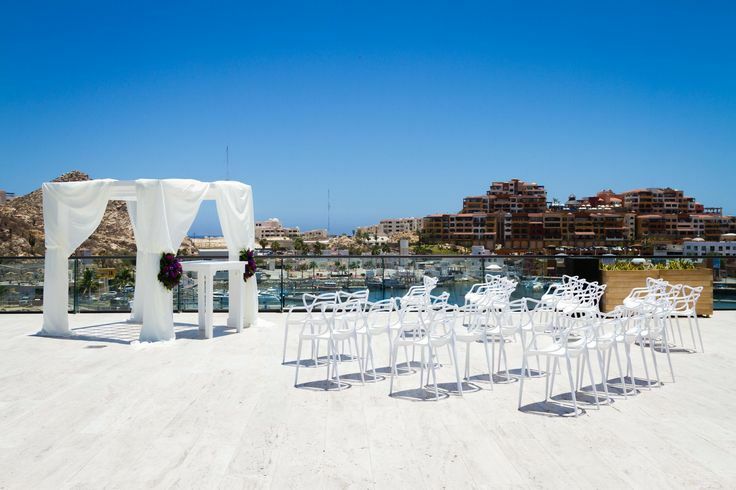 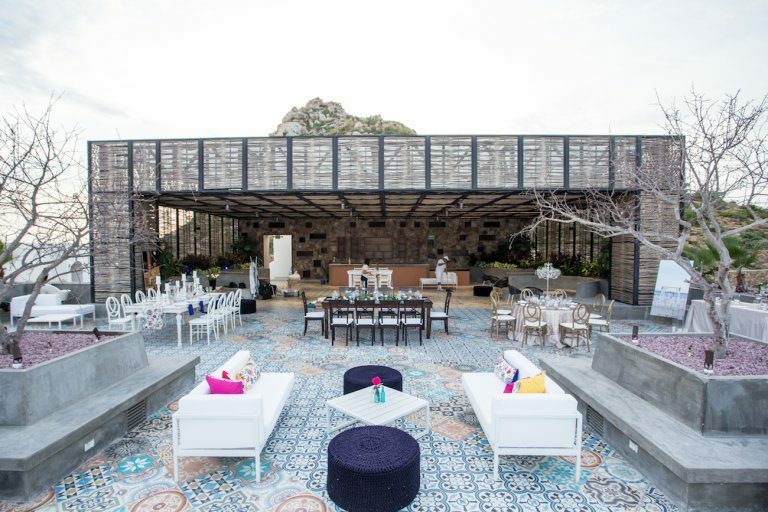 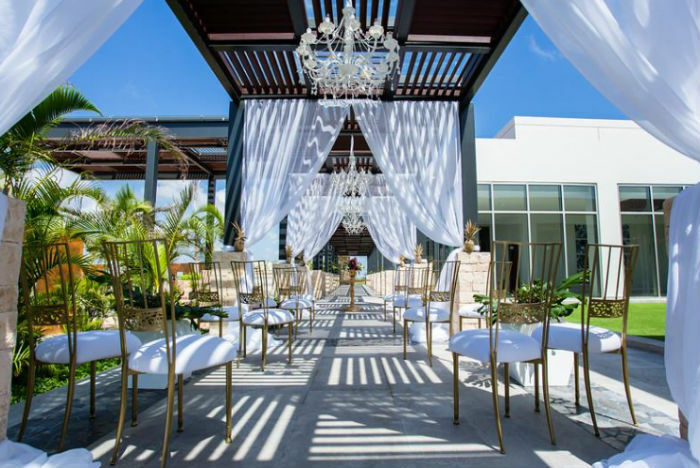 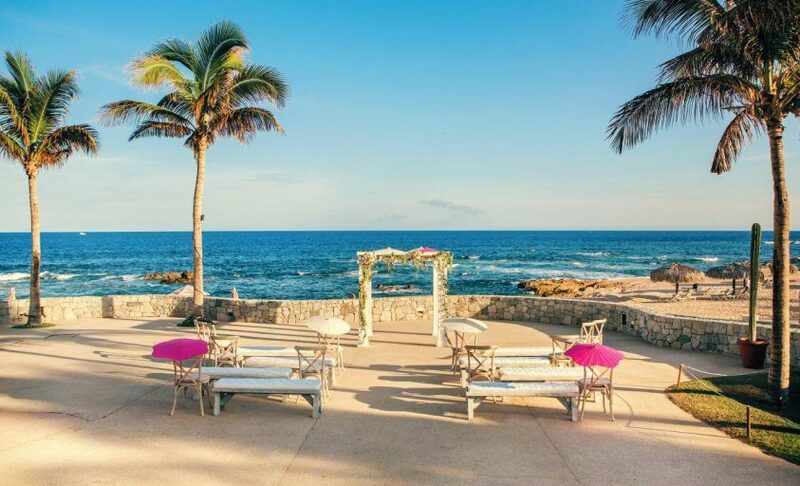 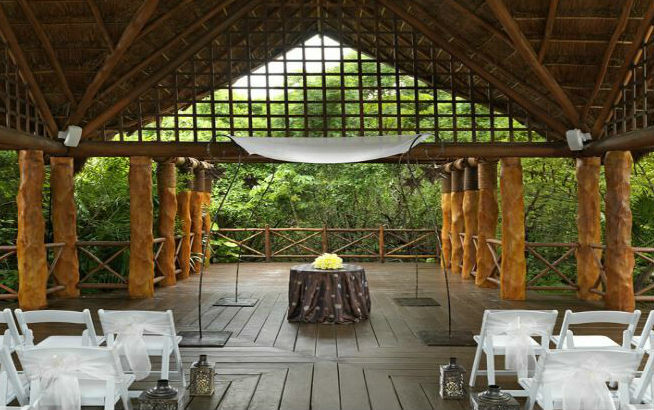 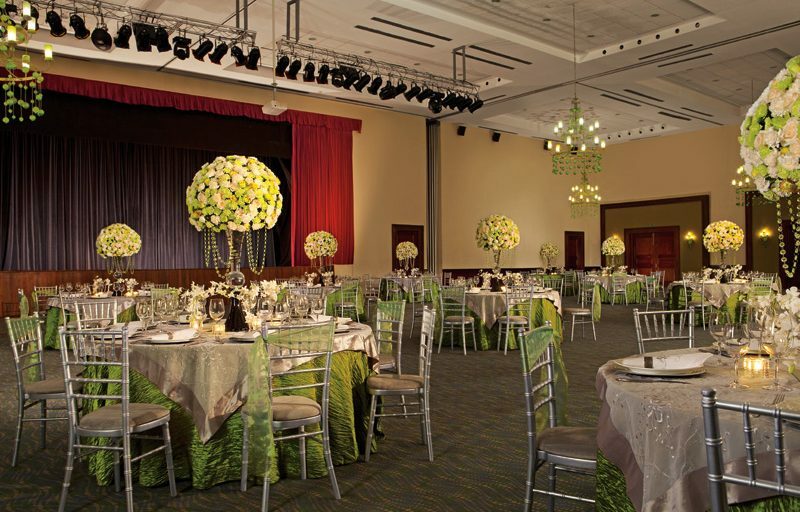 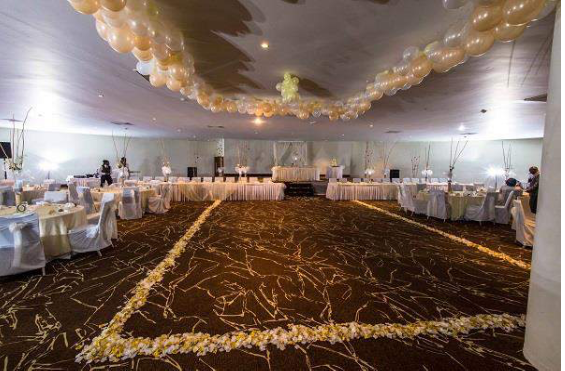 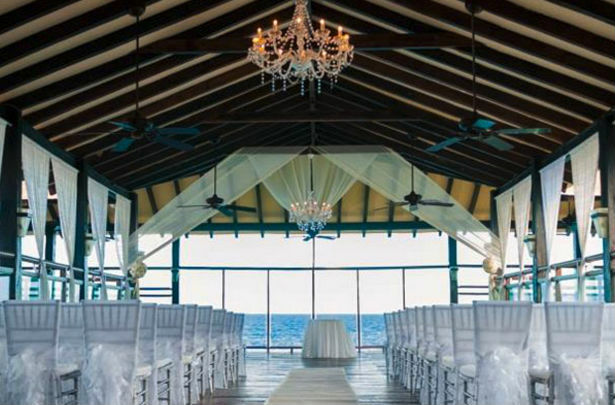 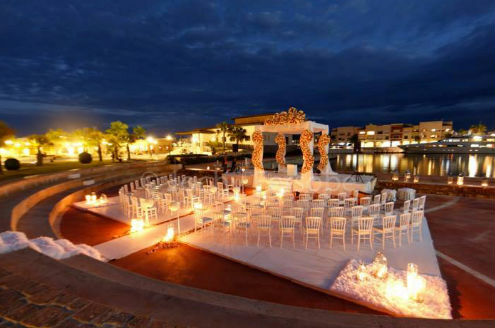 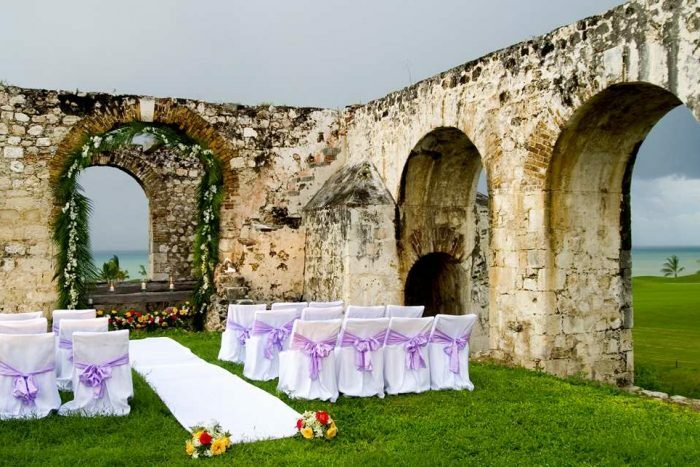 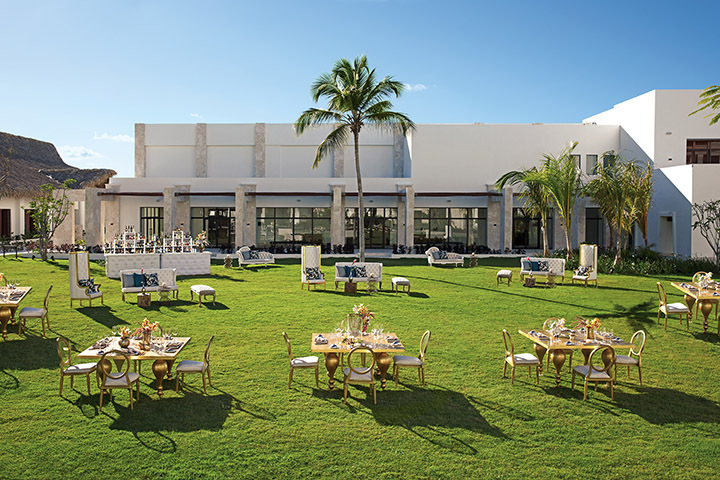 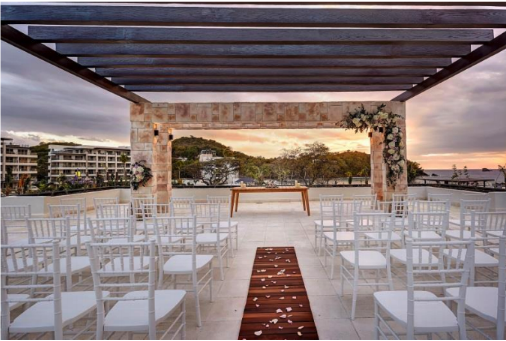 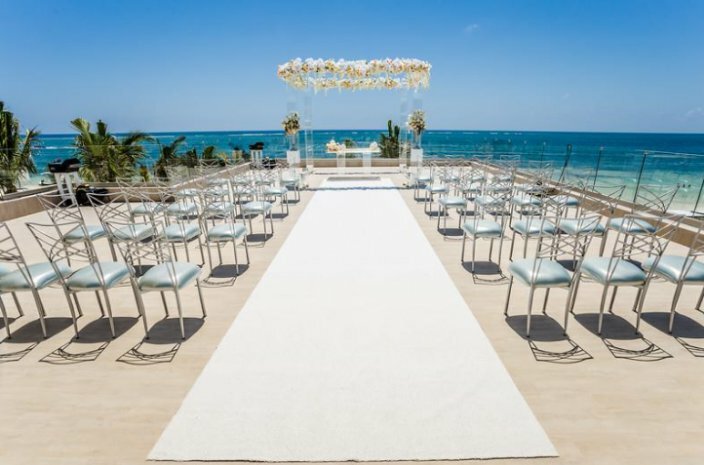 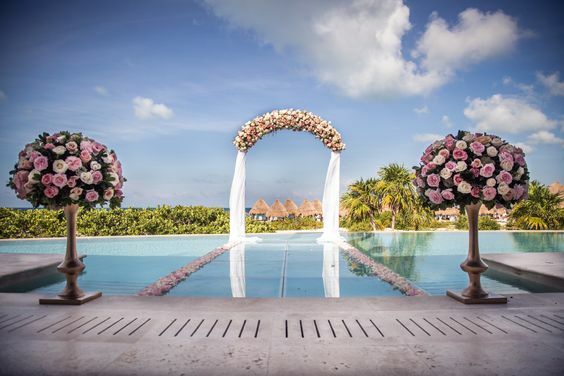 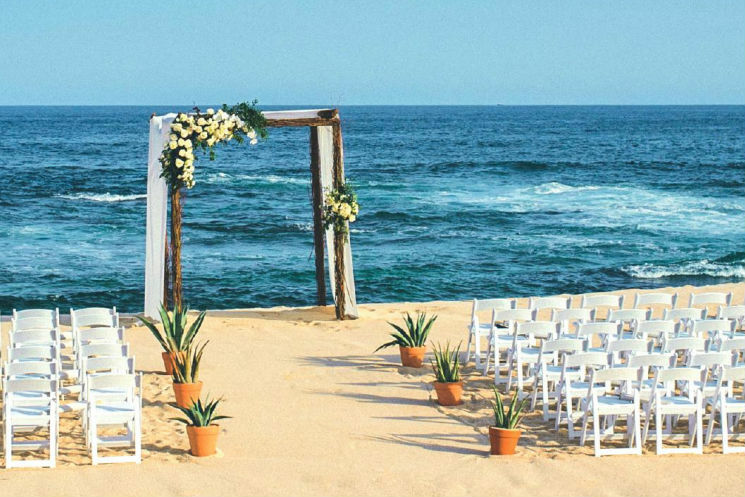 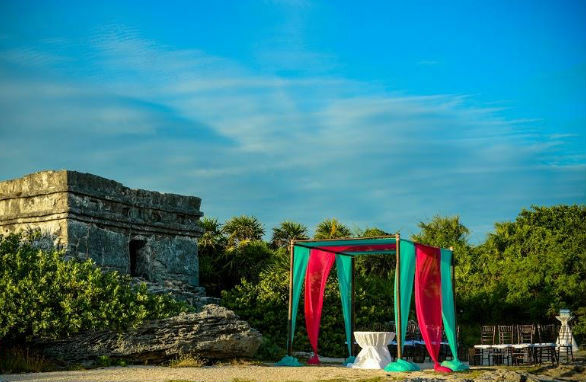 These venues make for perfect ceremony or reception locations.We have plenty of unique ceremony locations too, from open-air ballrooms to amphitheaters and Mexican cenotes. 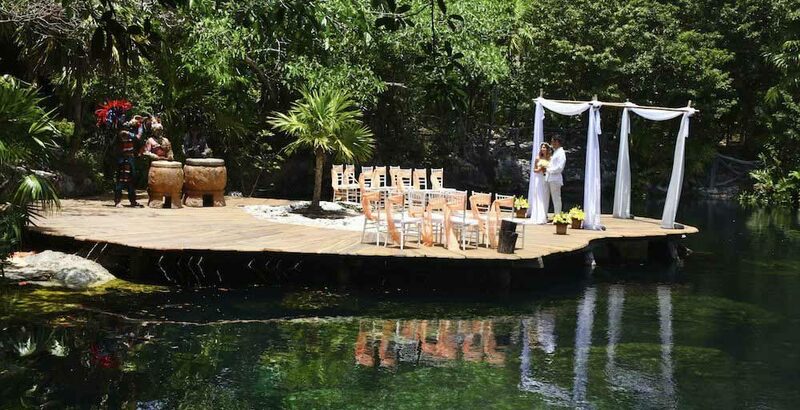 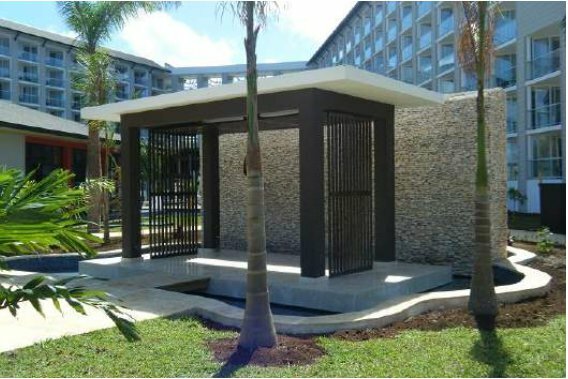 There are even some venues that feature waterfalls or private piers. 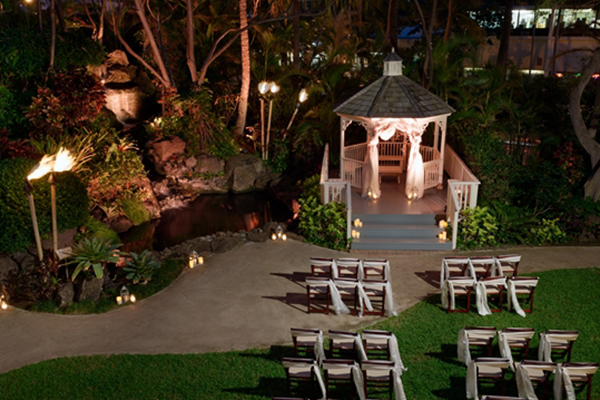 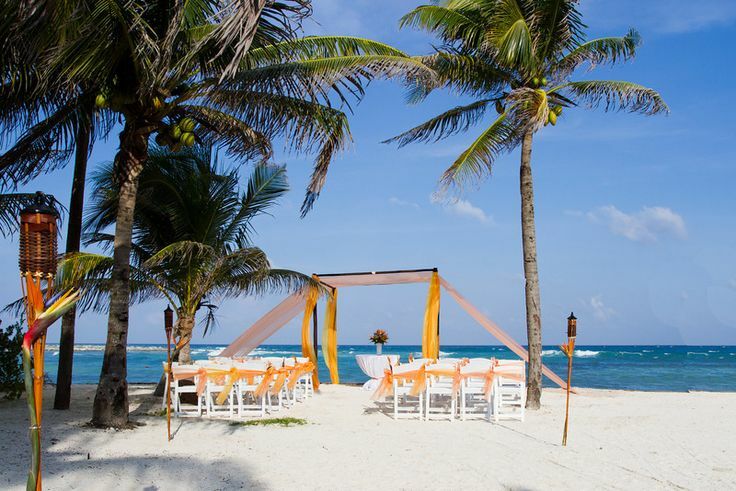 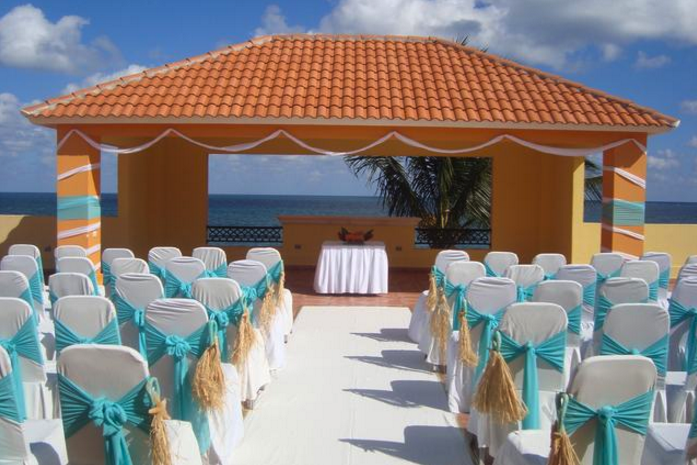 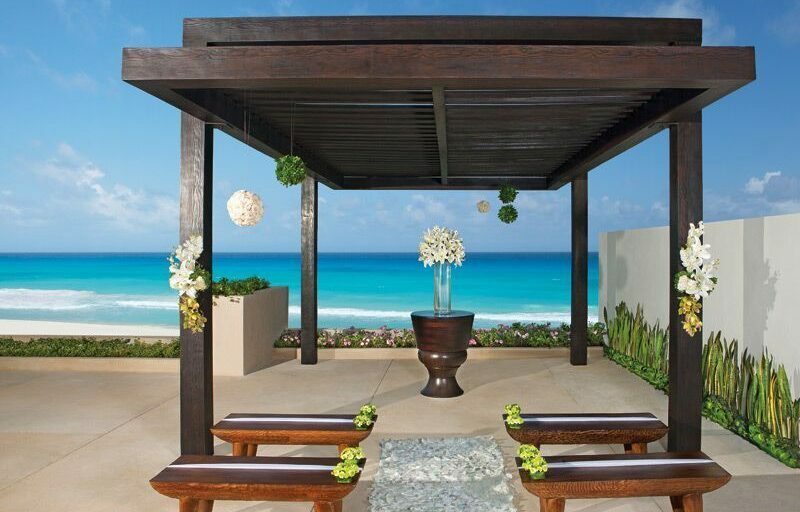 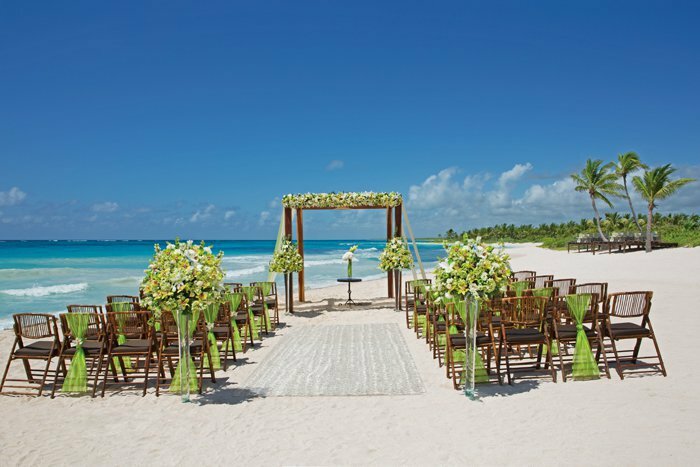 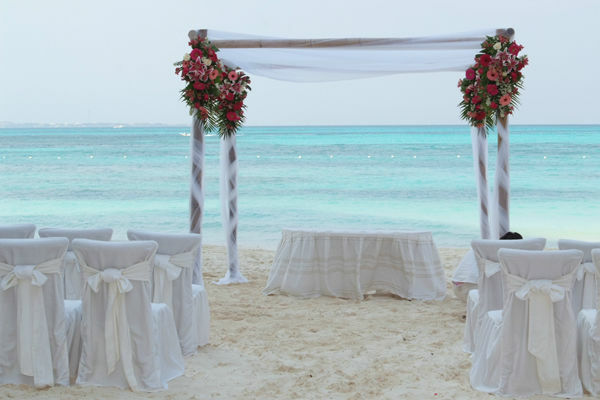 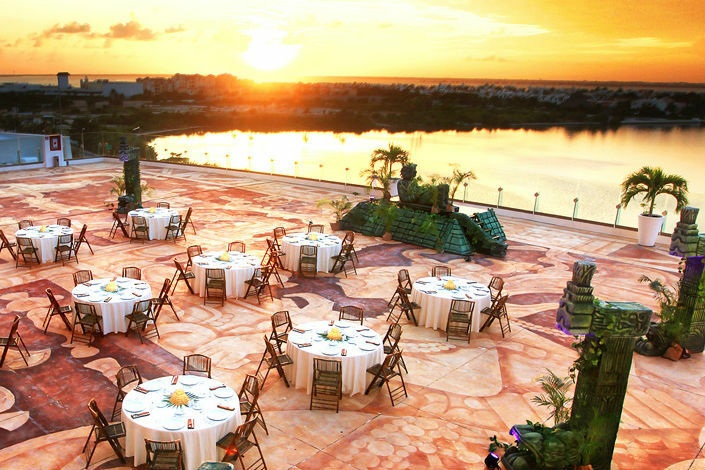 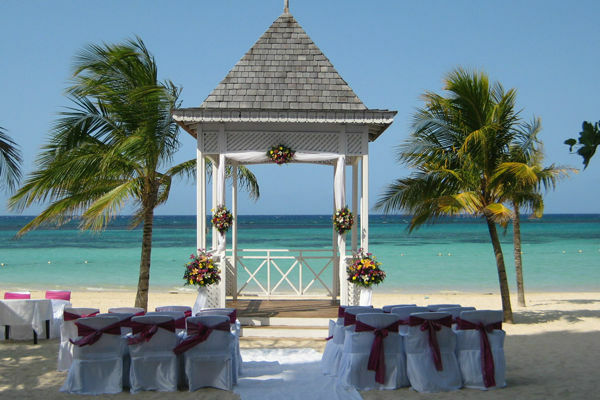 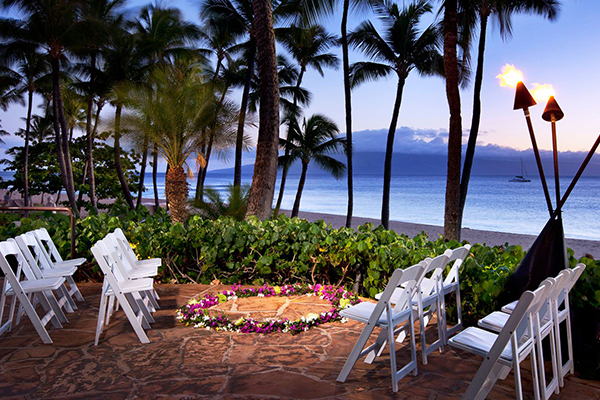 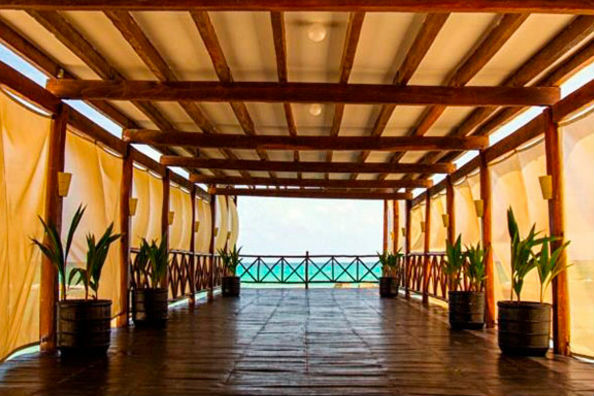 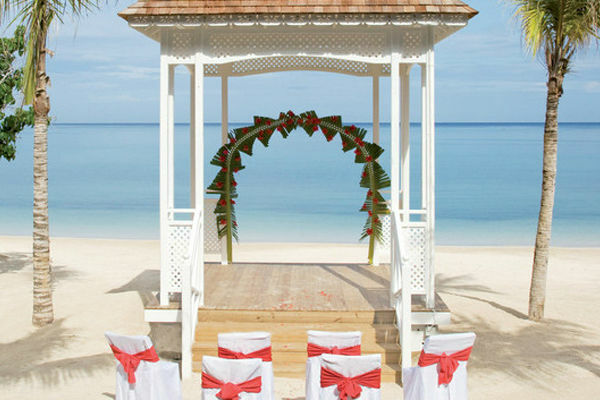 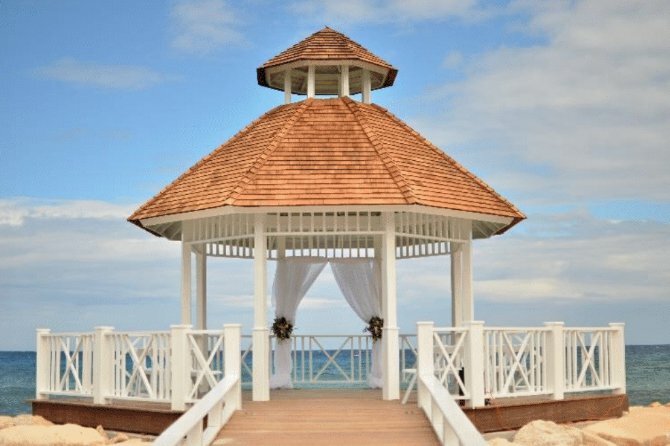 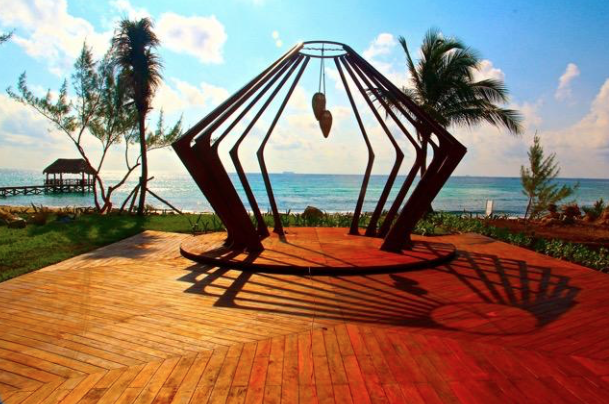 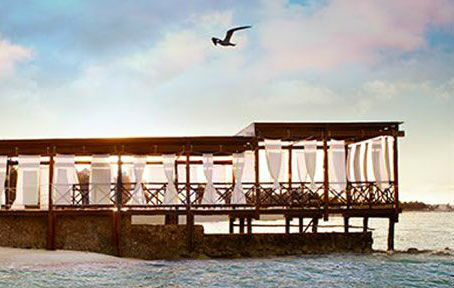 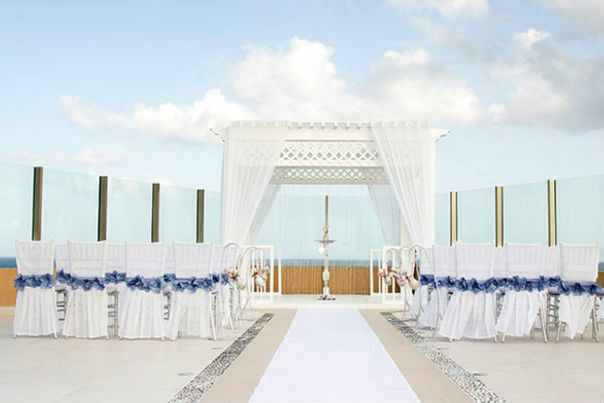 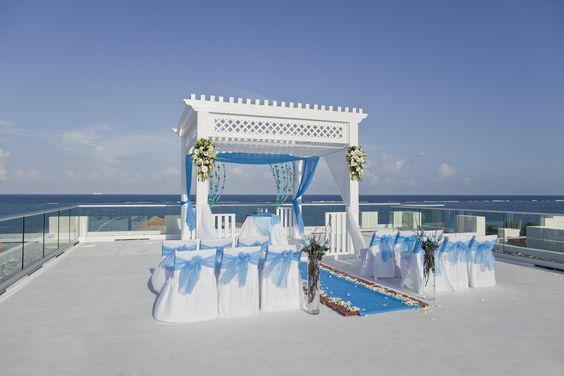 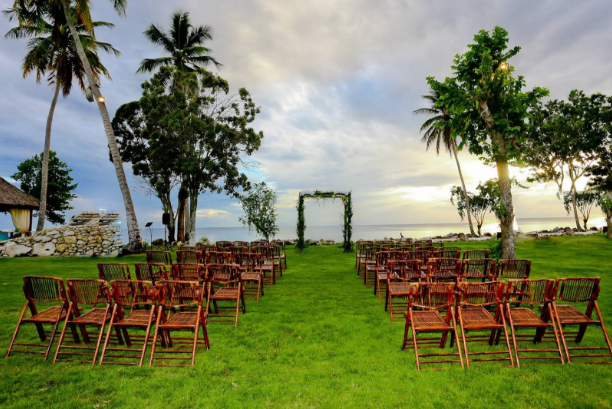 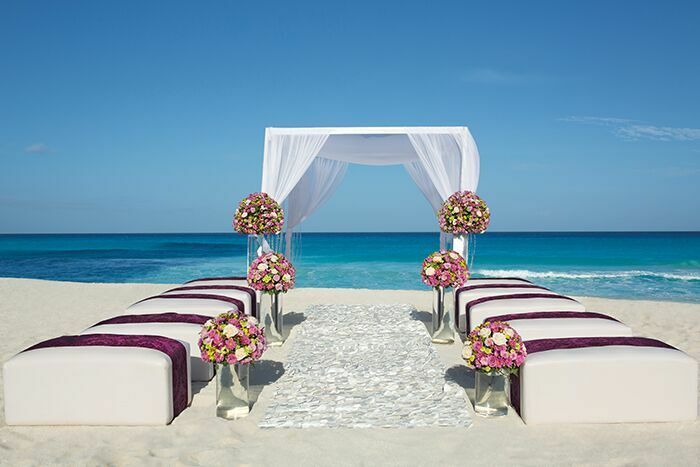 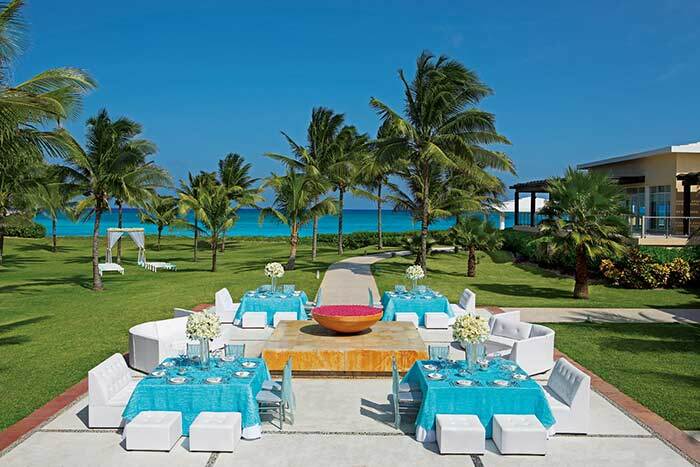 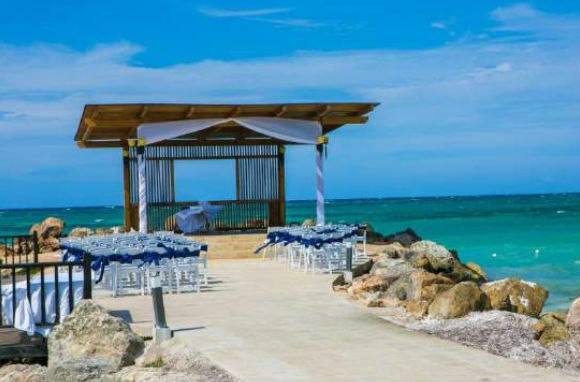 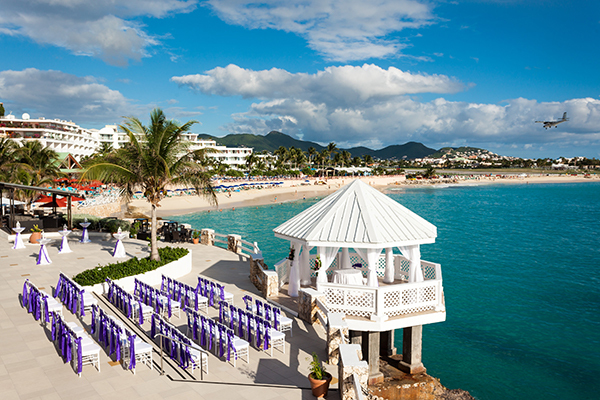 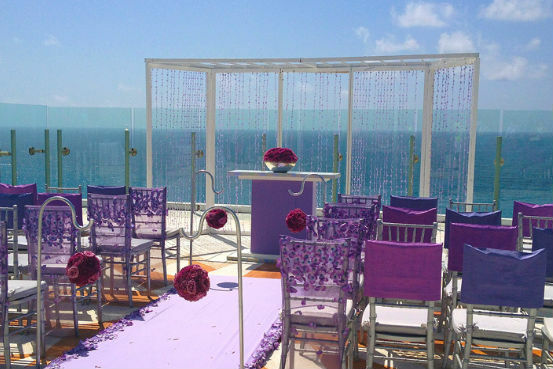 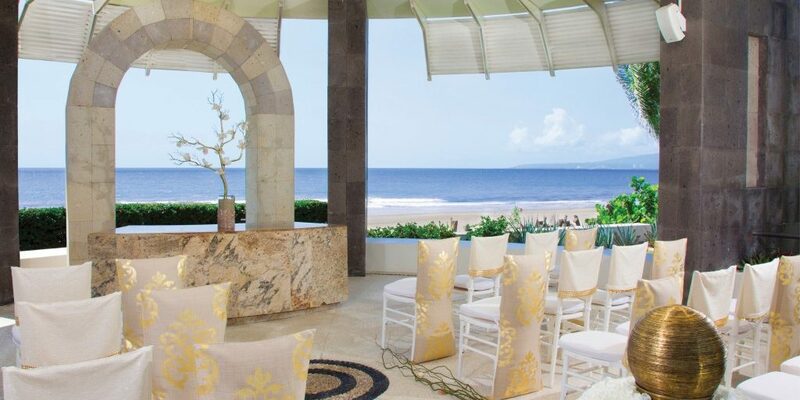 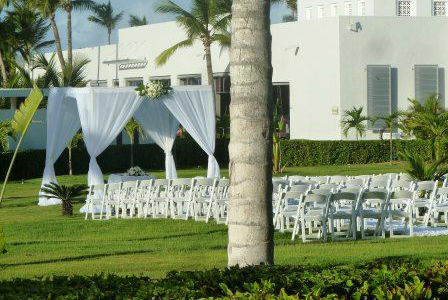 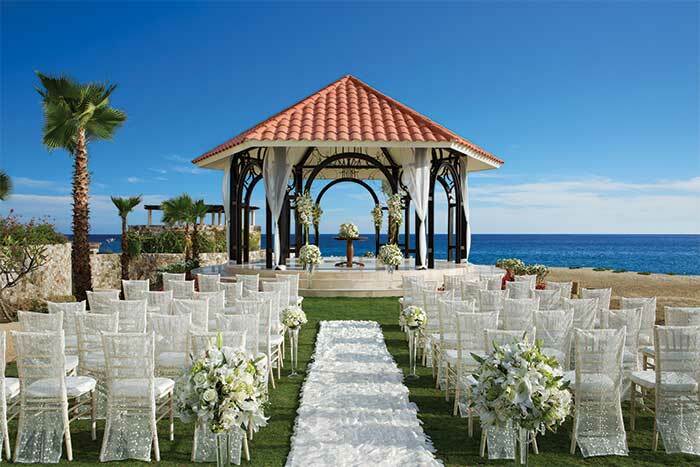 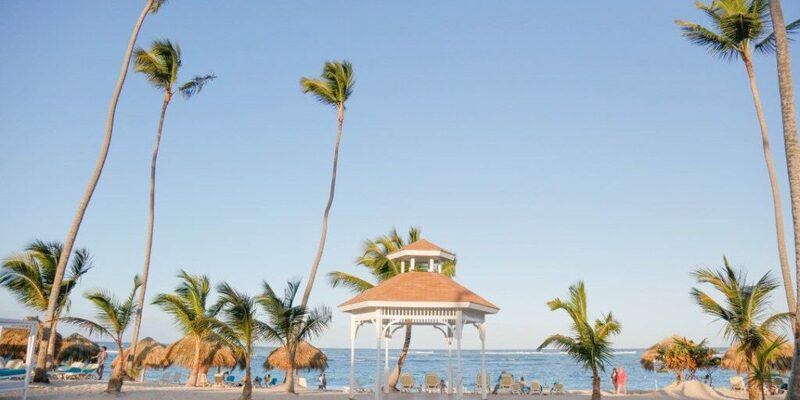 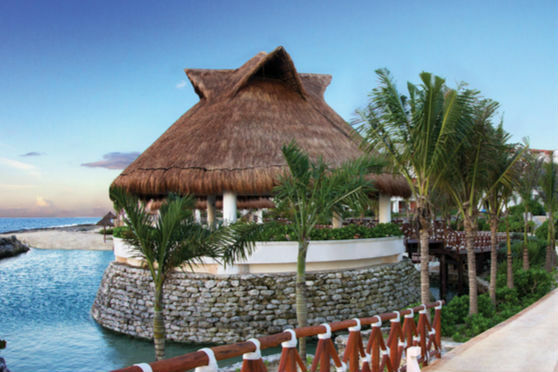 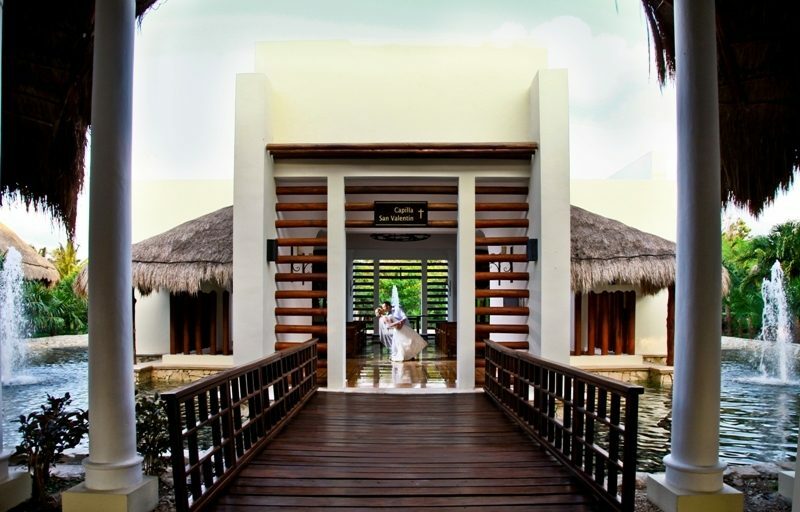 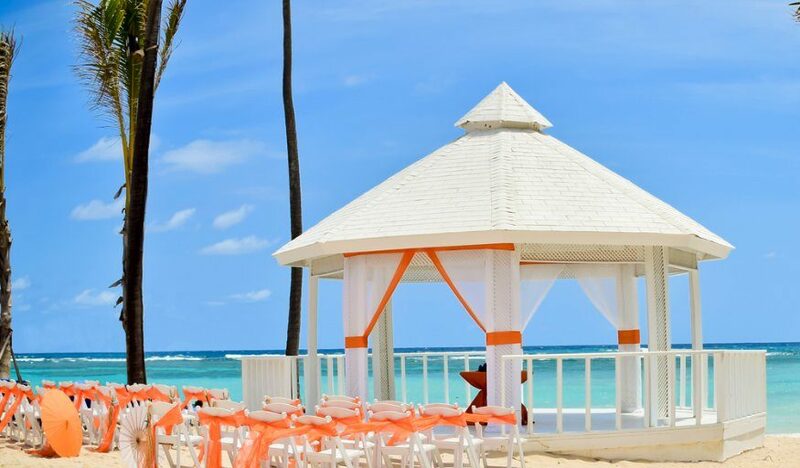 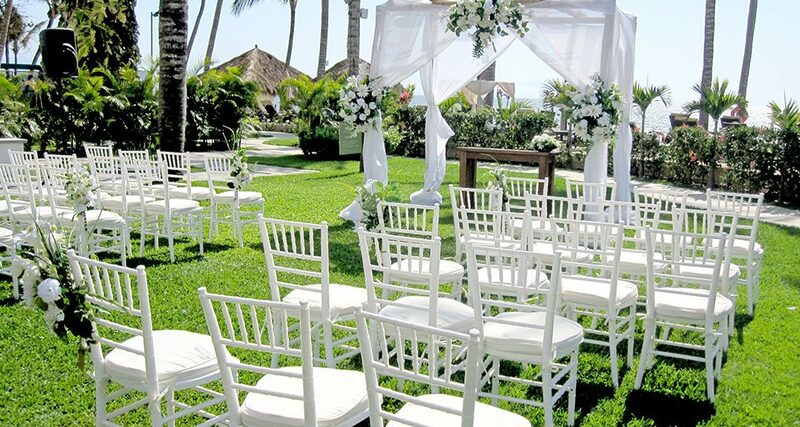 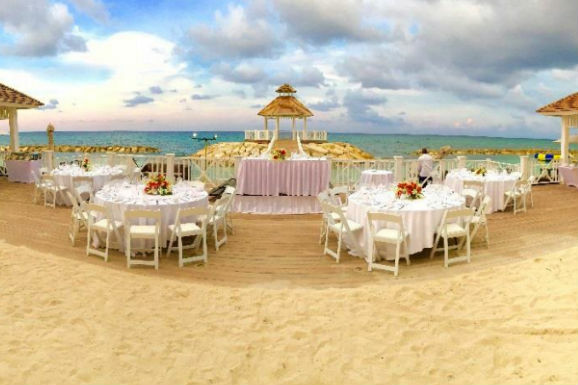 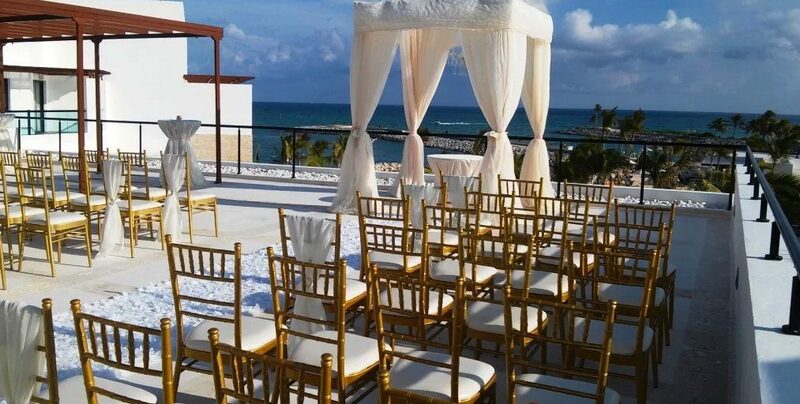 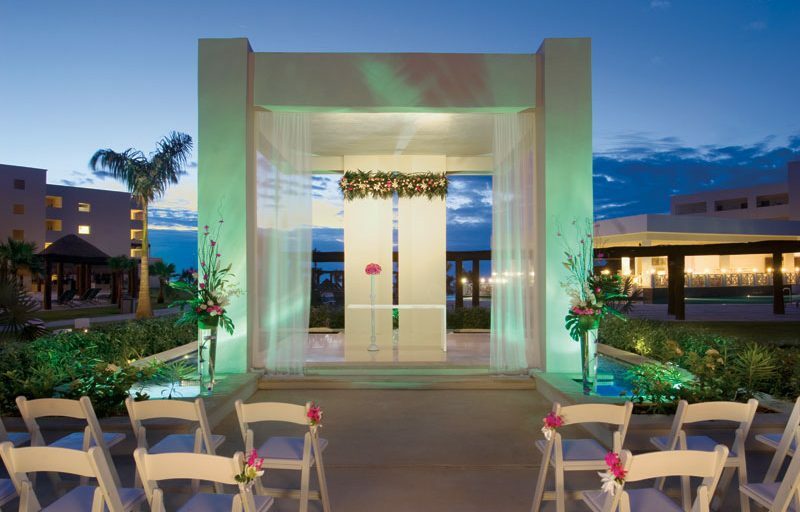 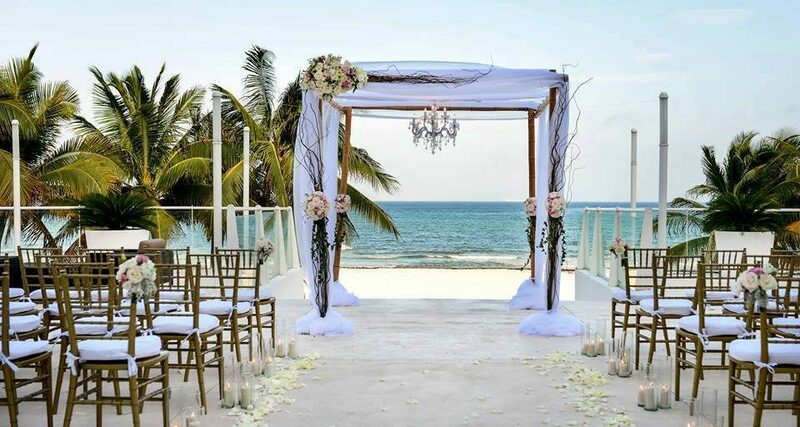 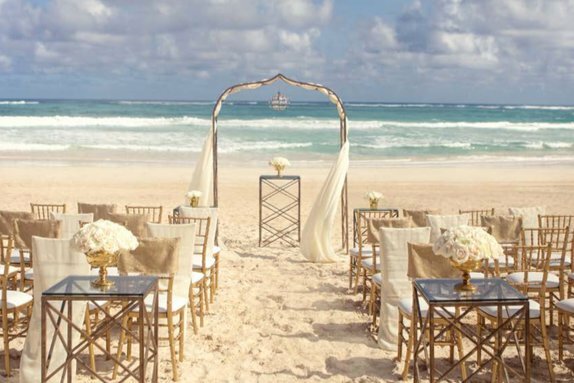 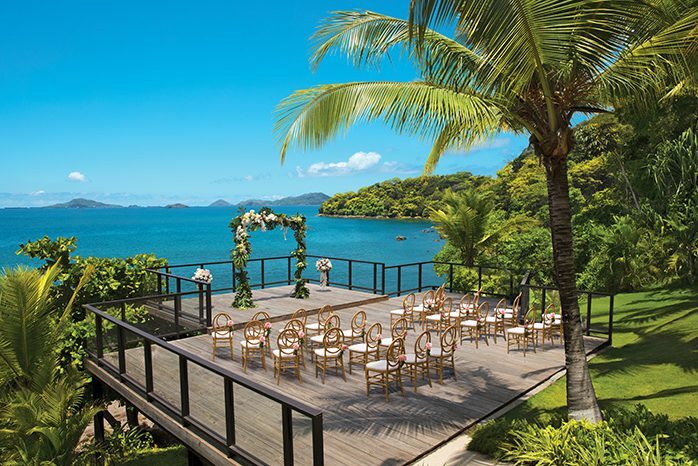 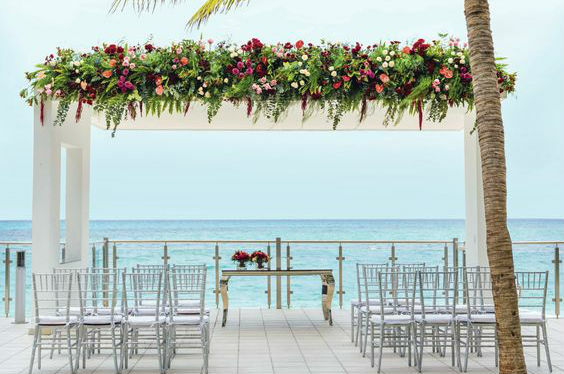 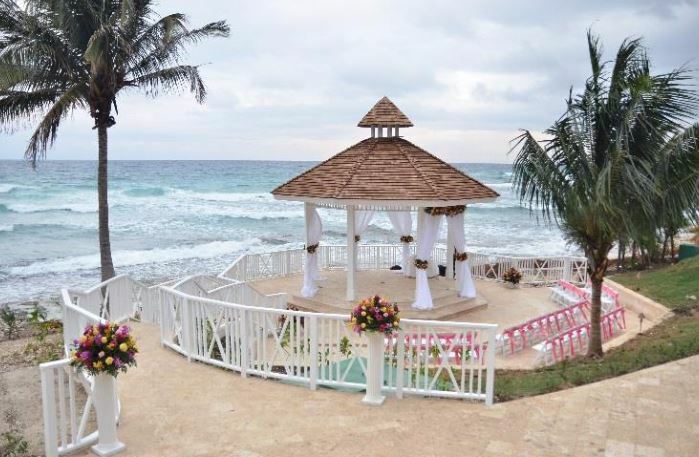 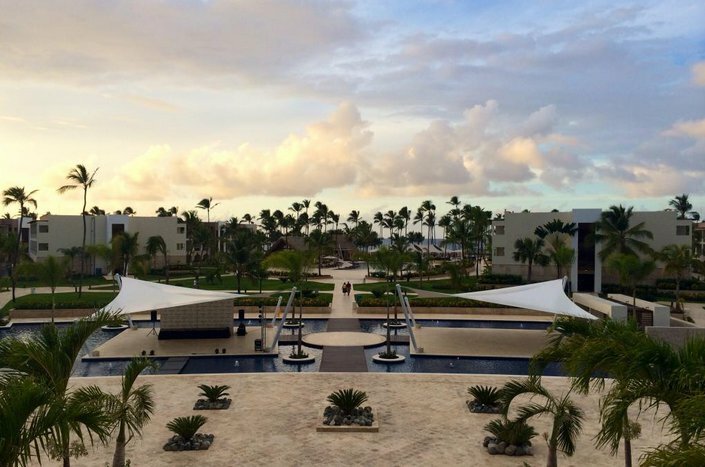 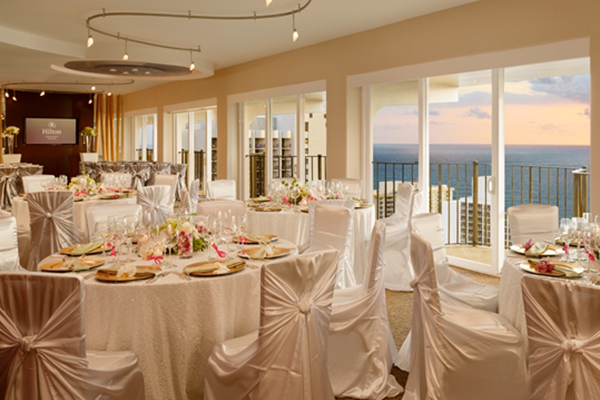 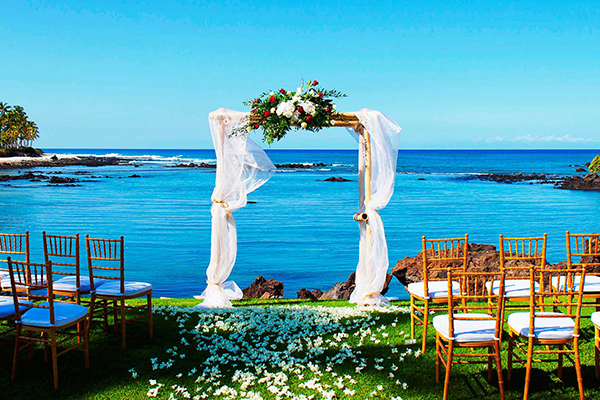 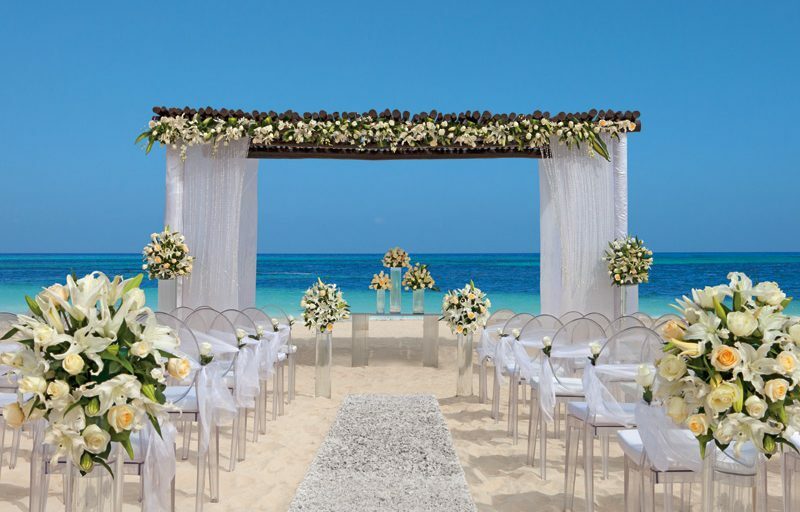 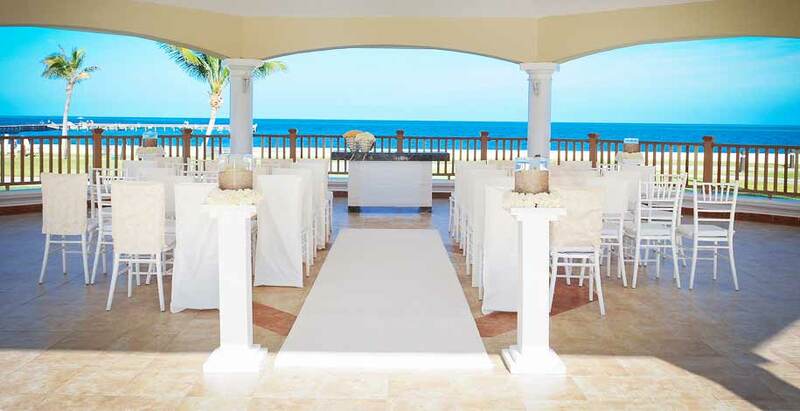 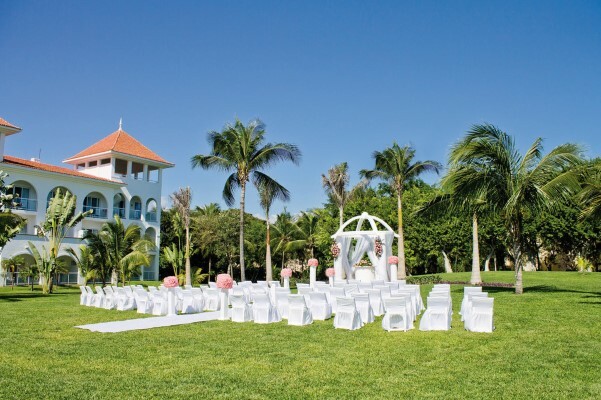 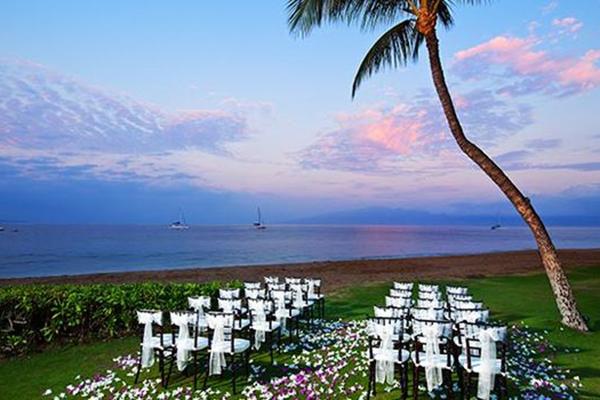 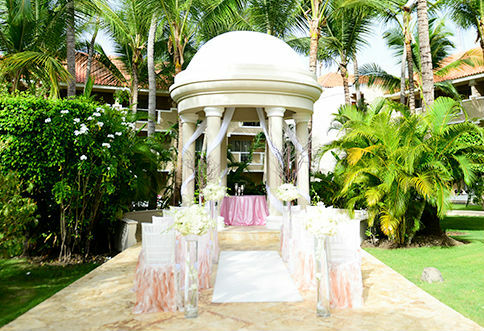 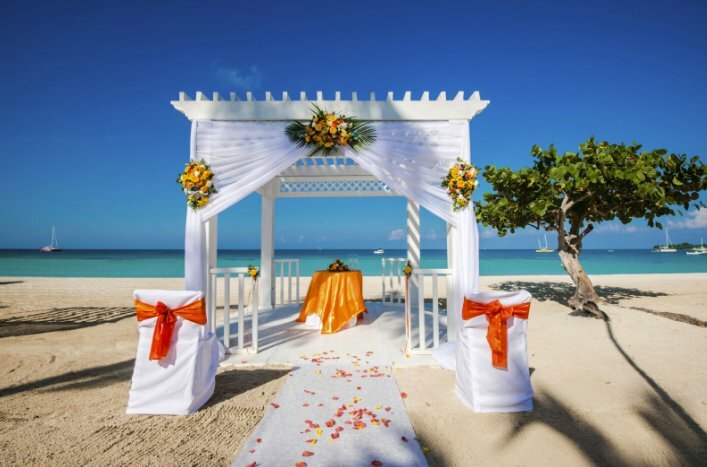 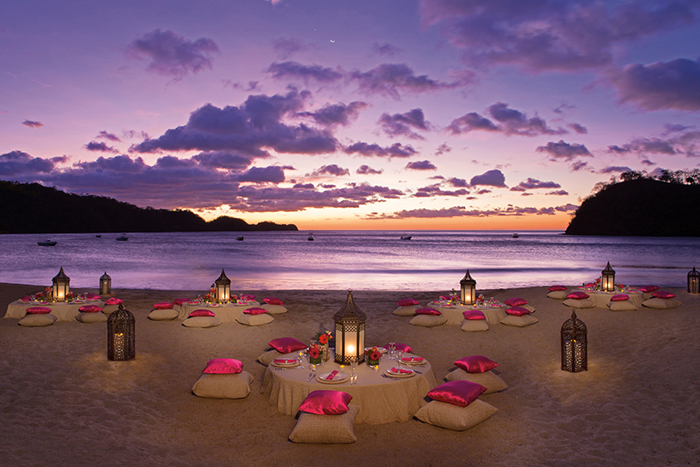 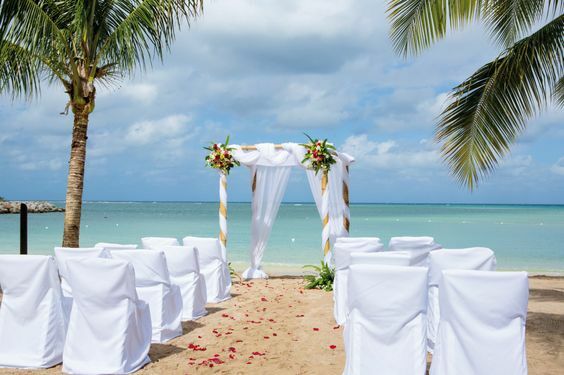 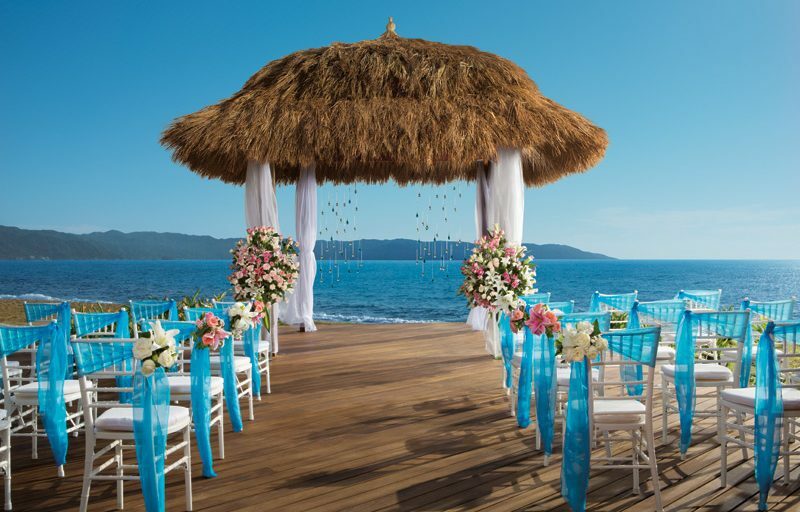 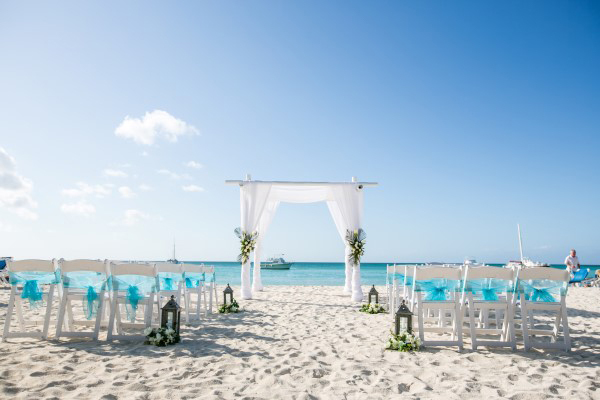 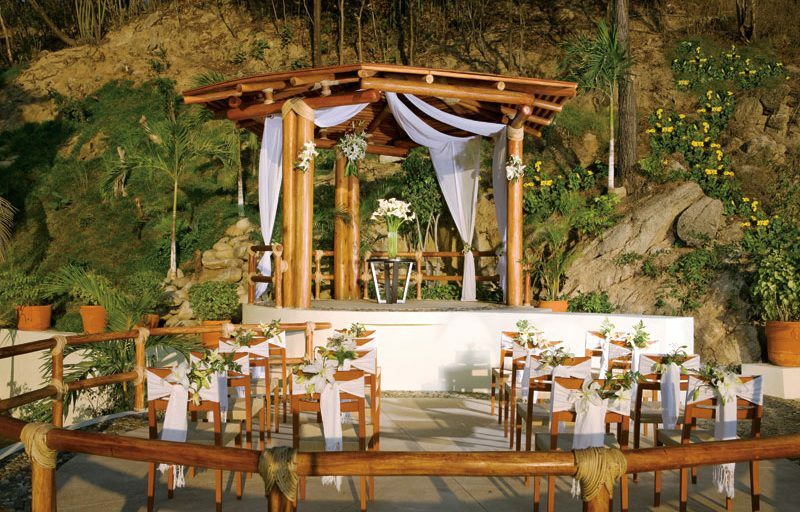 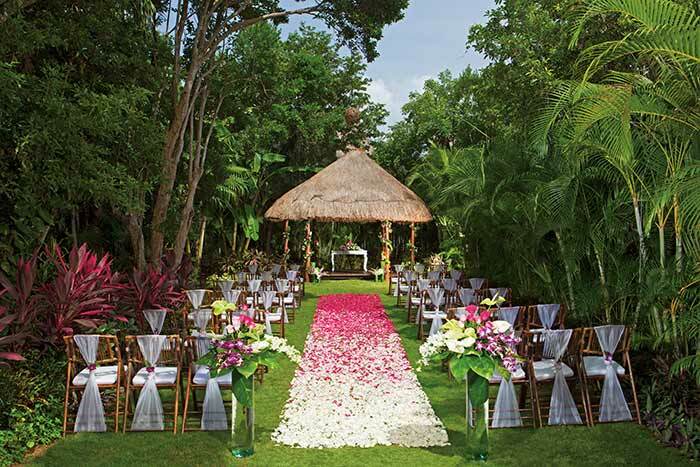 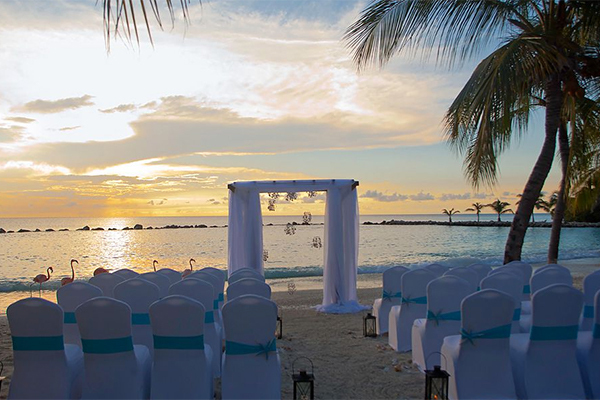 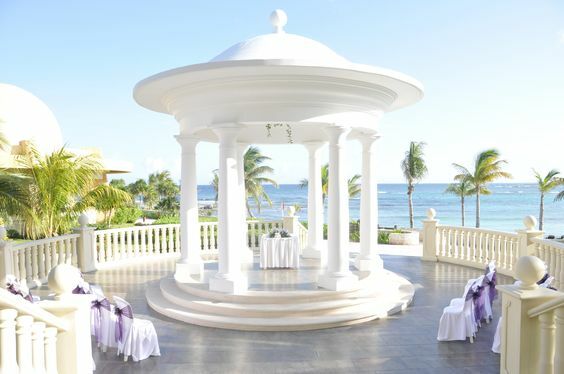 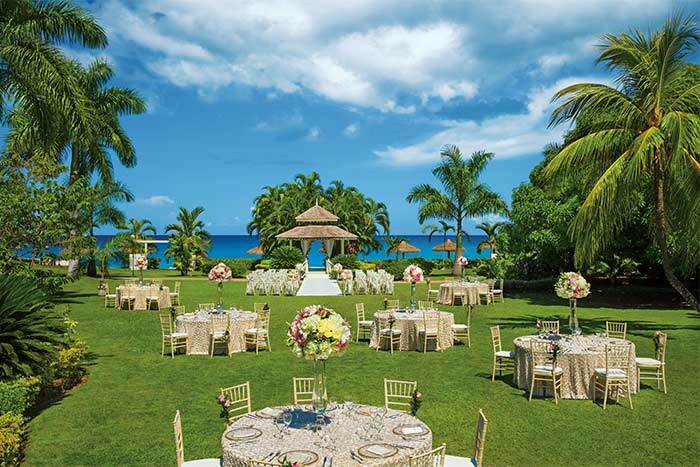 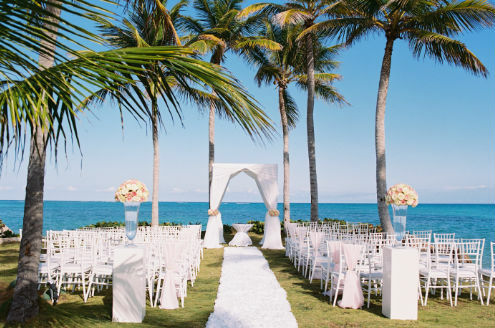 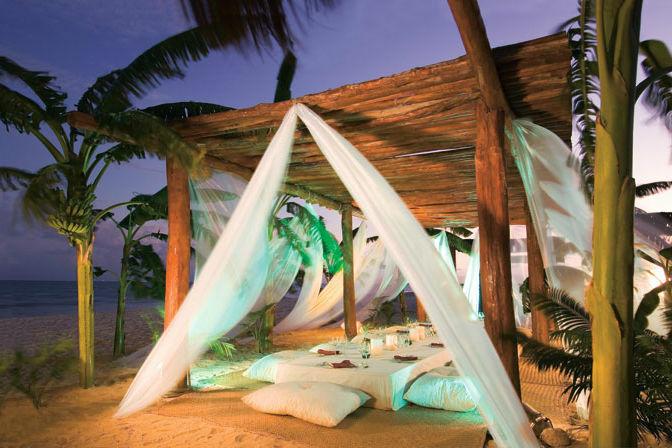 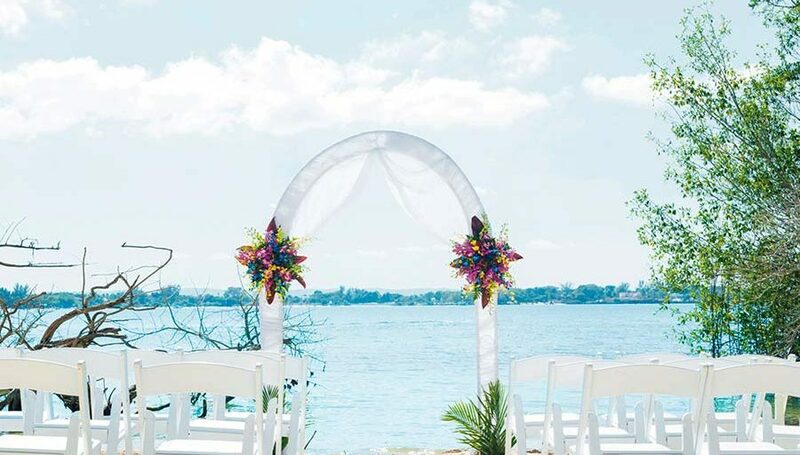 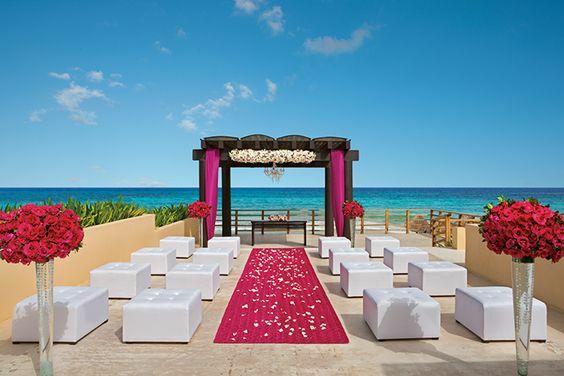 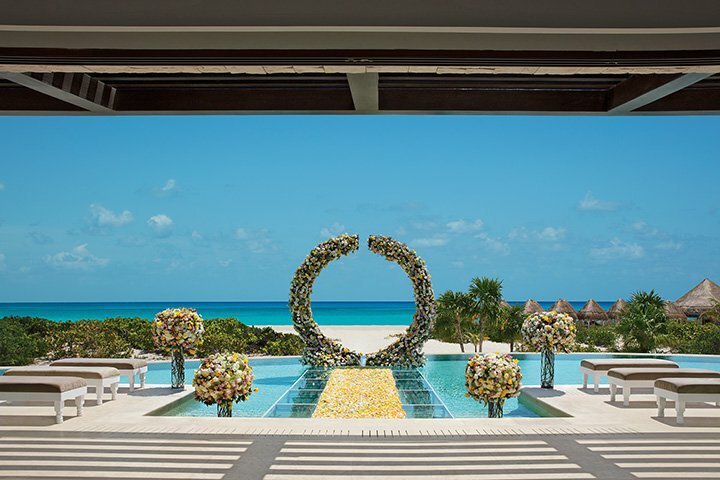 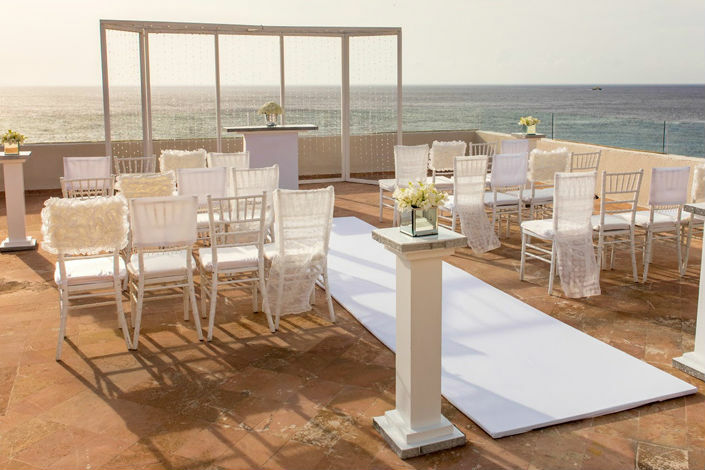 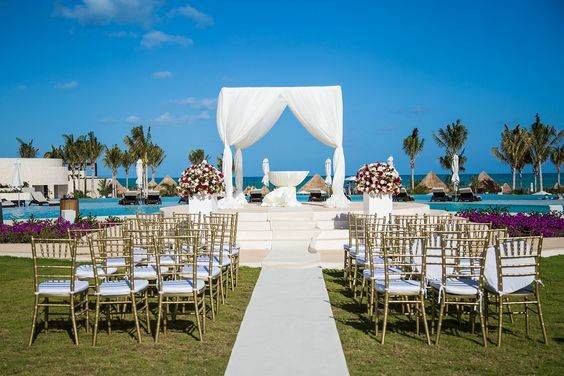 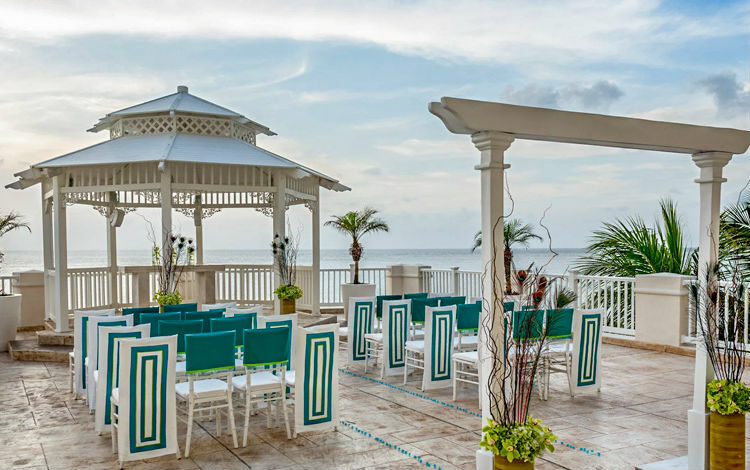 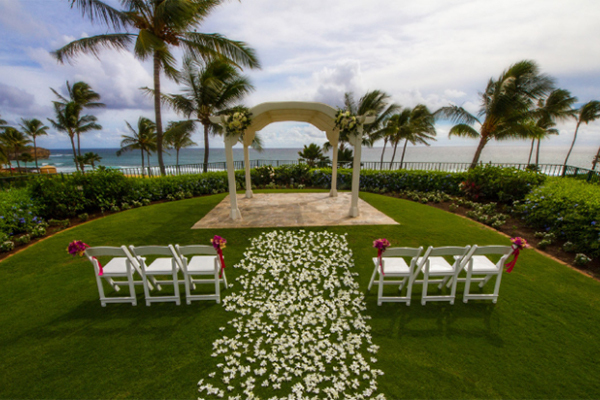 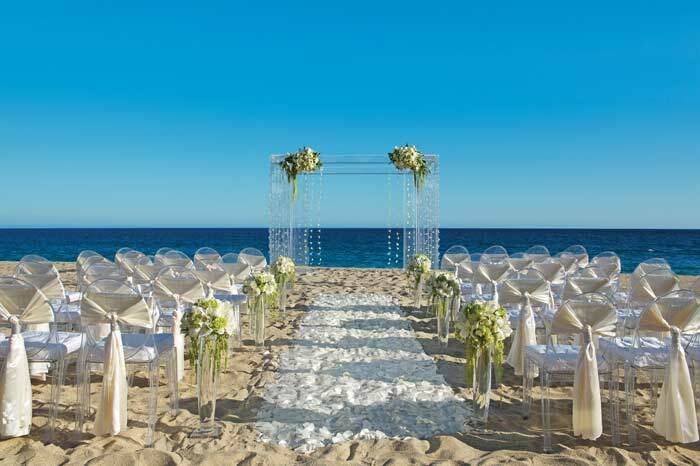 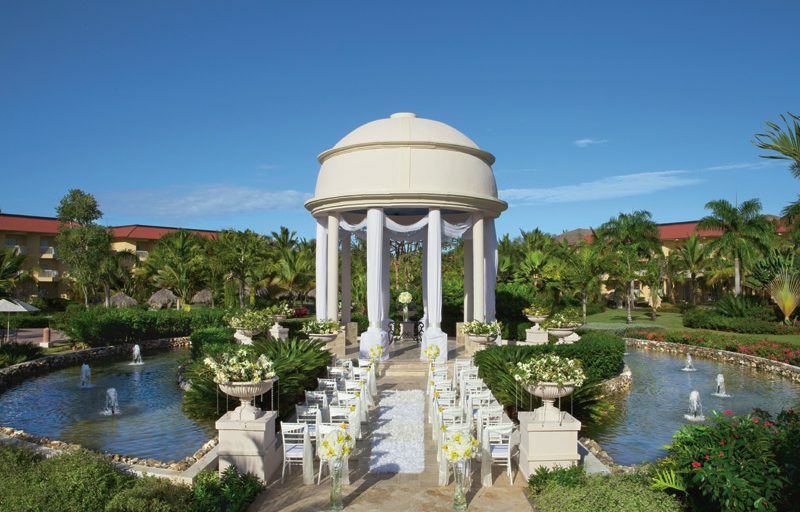 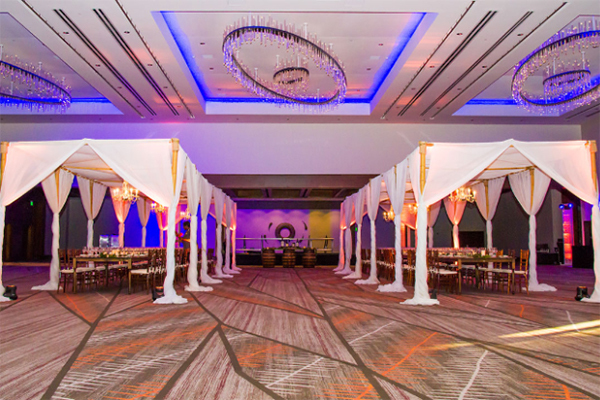 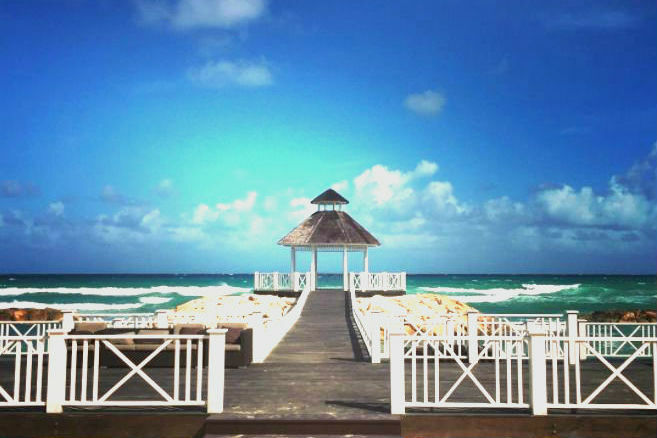 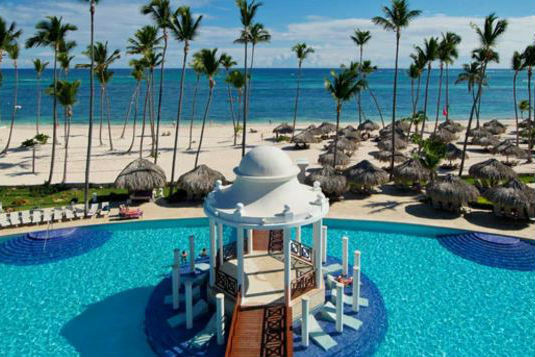 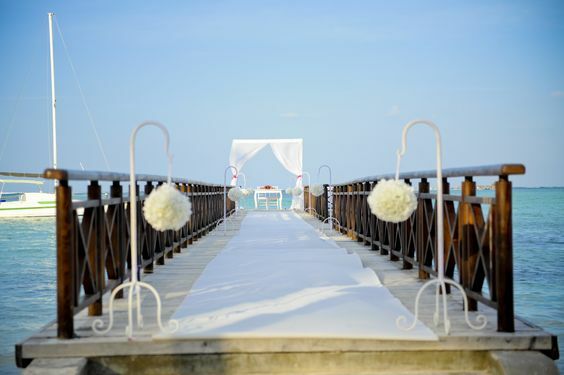 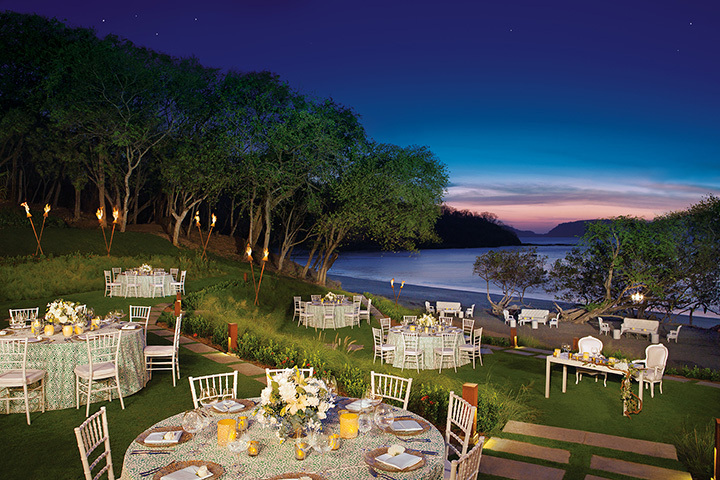 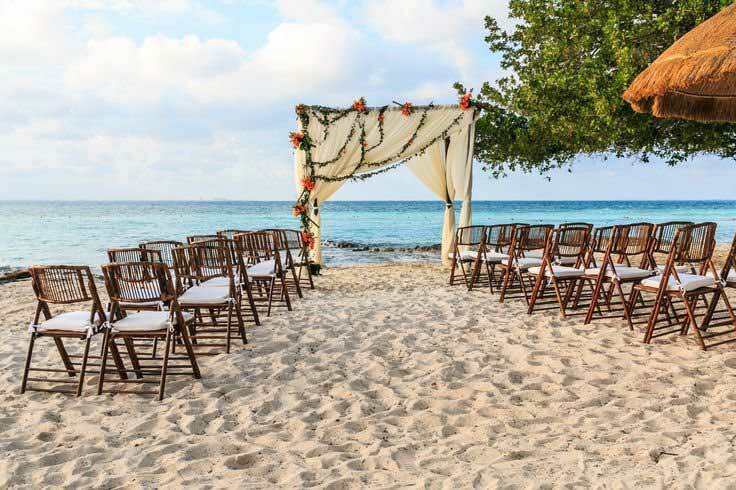 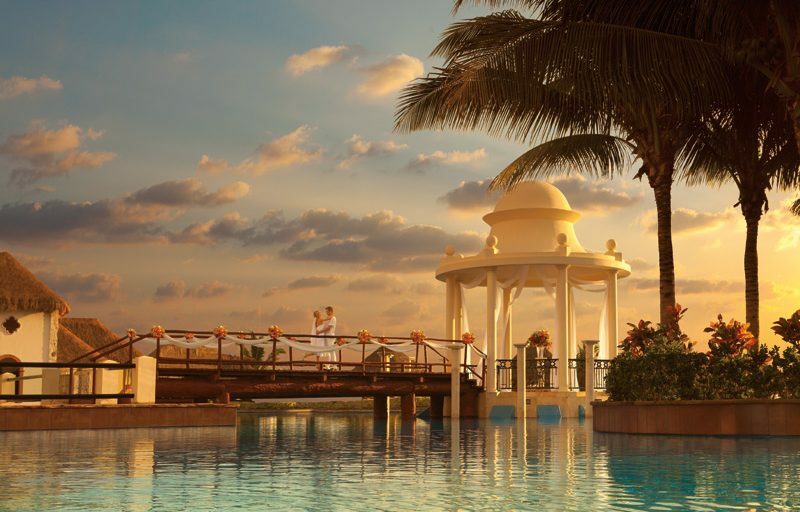 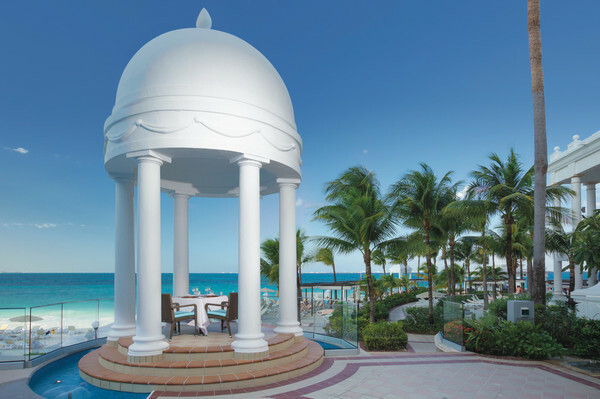 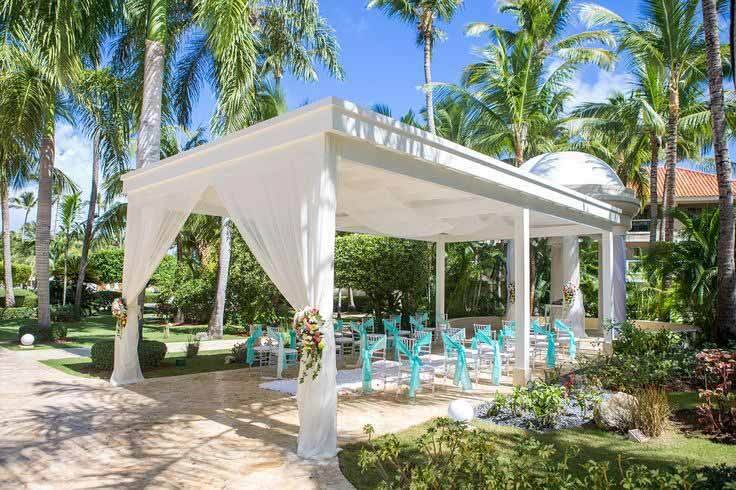 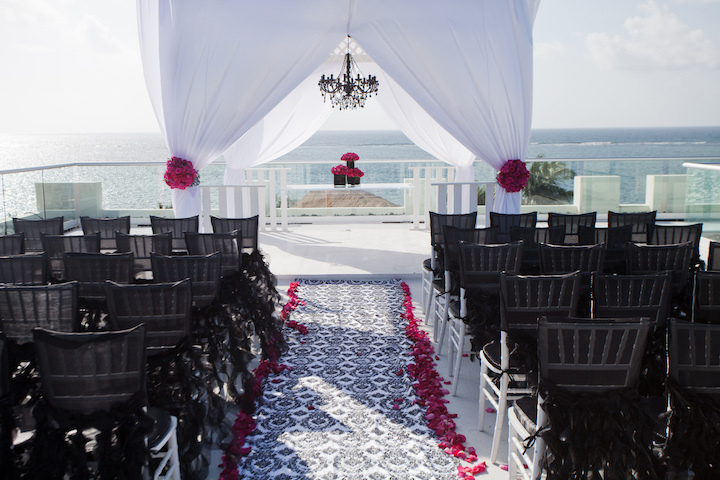 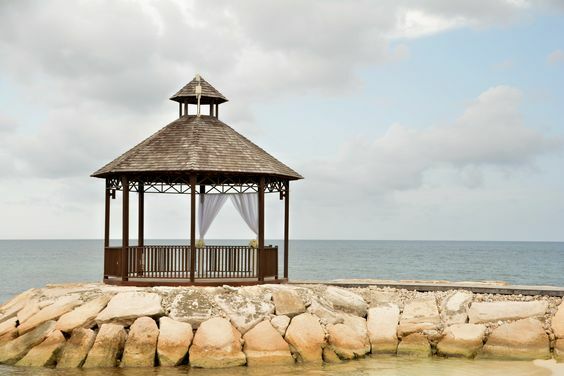 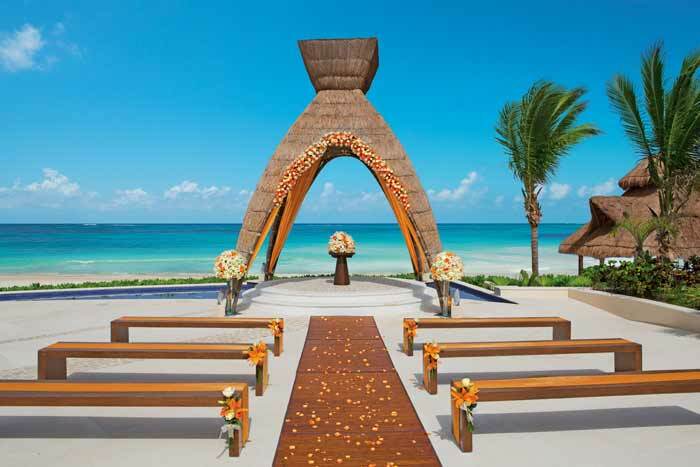 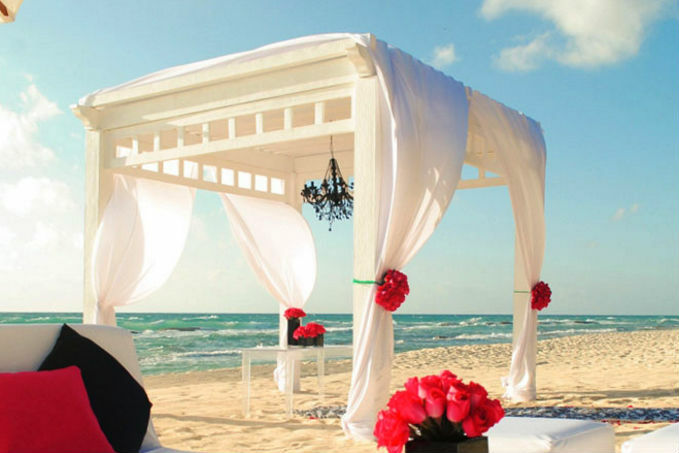 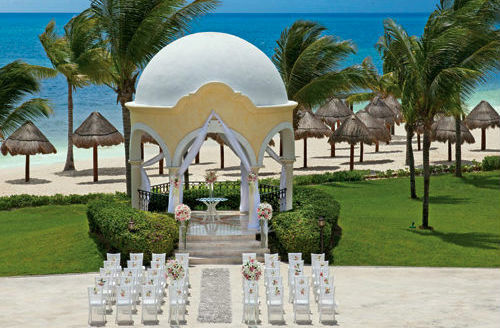 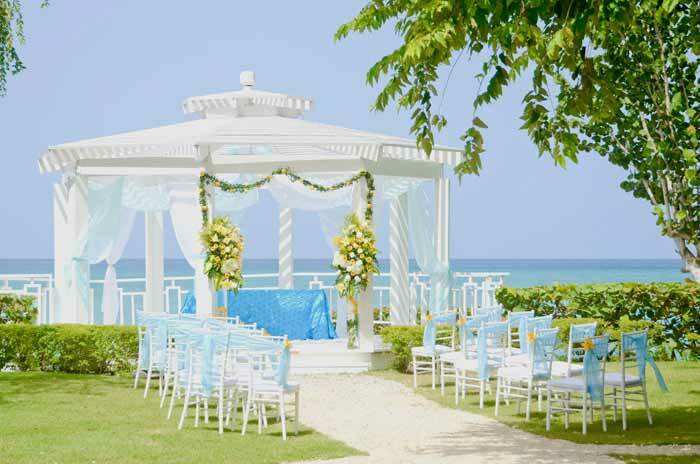 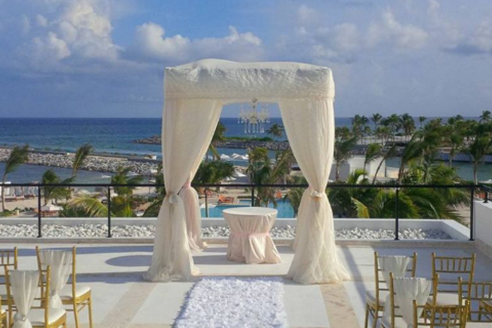 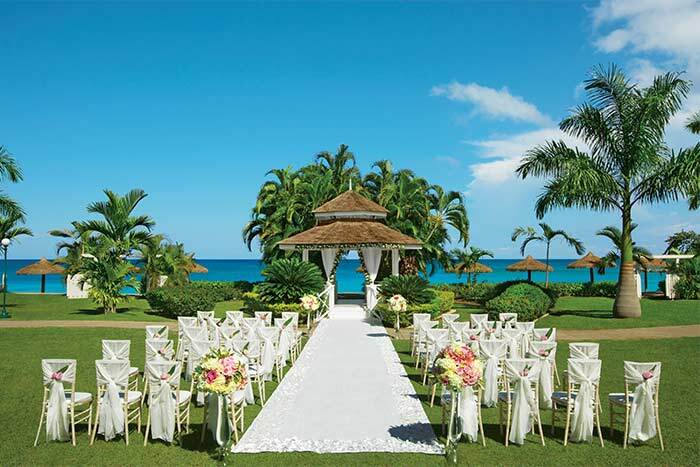 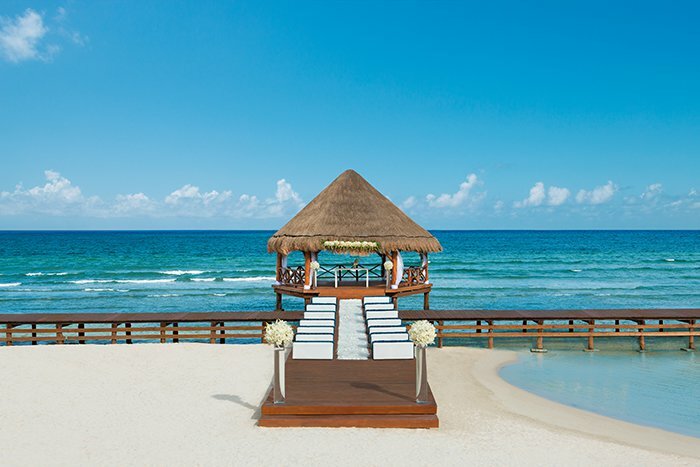 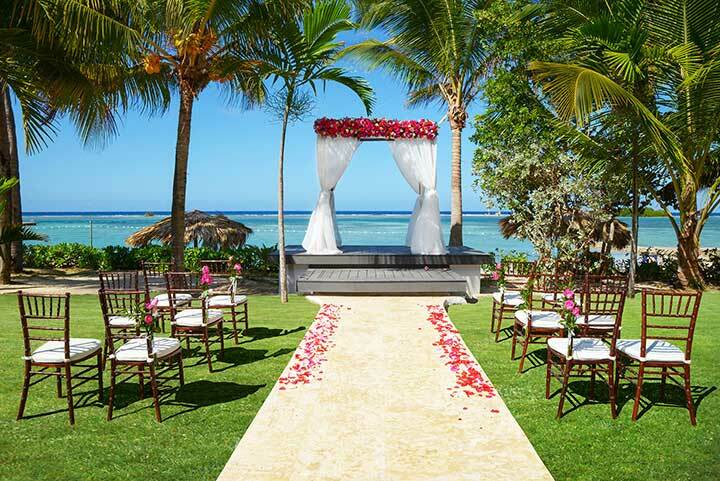 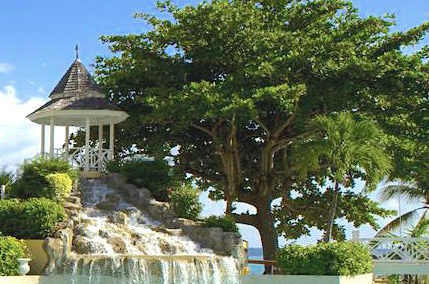 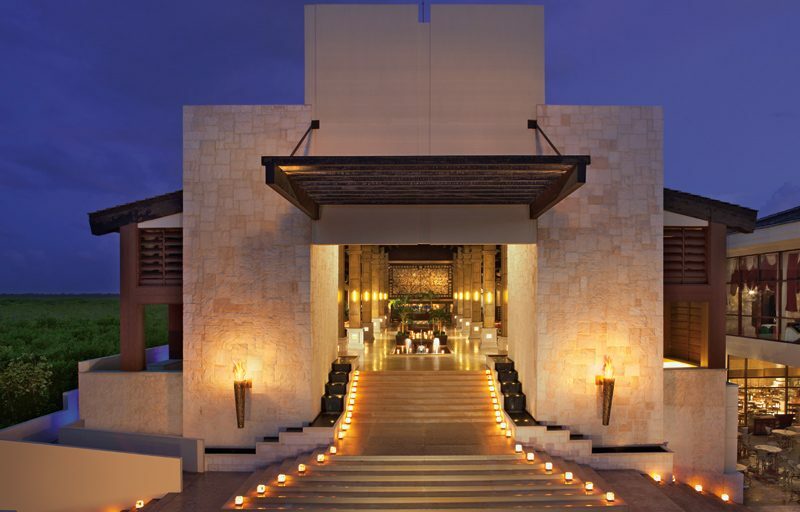 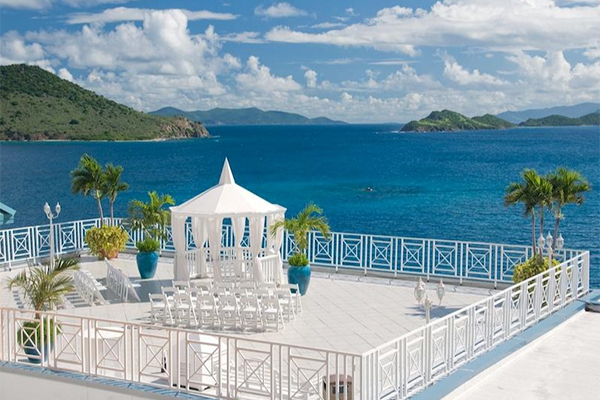 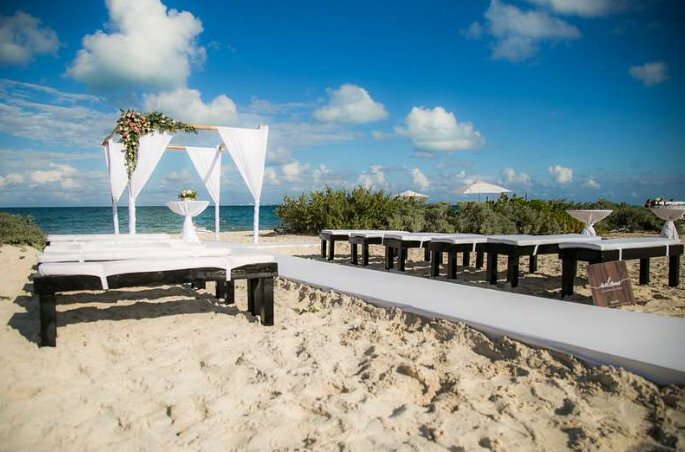 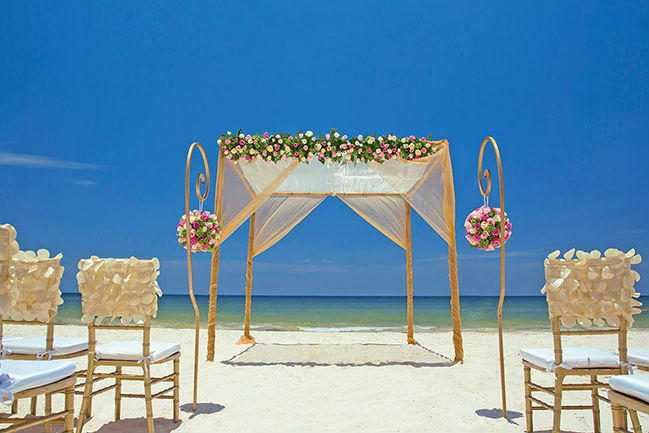 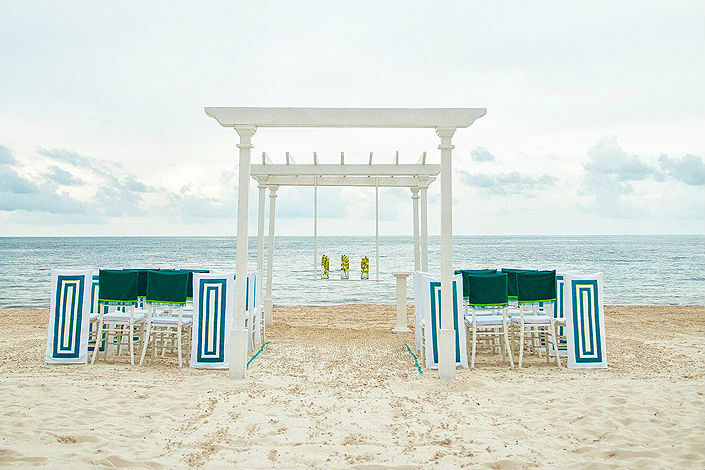 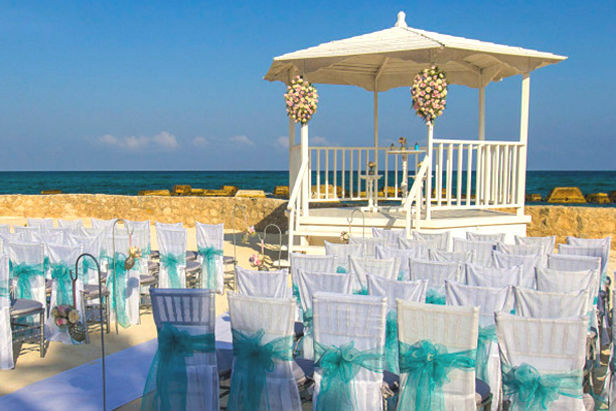 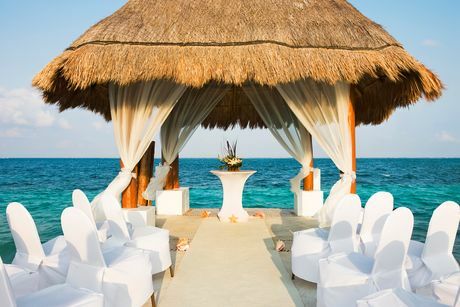 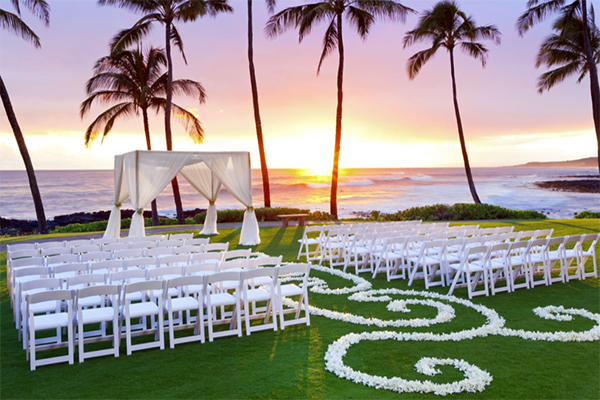 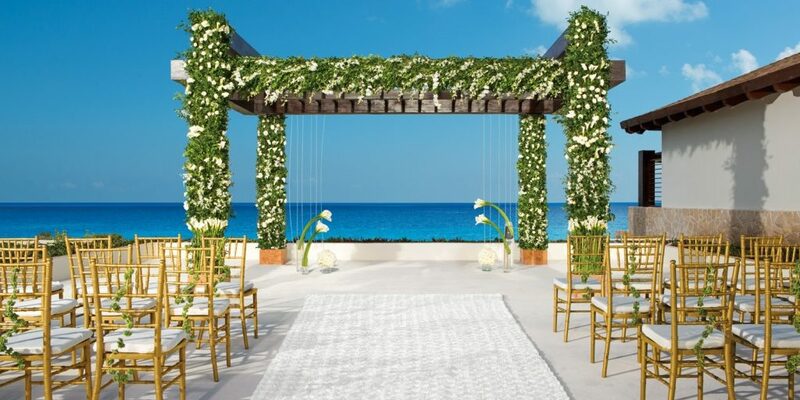 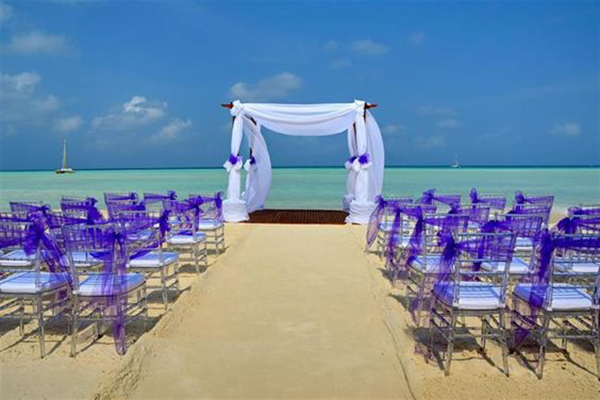 All-inclusive resorts have everything needed to make your ceremony extraordinary.